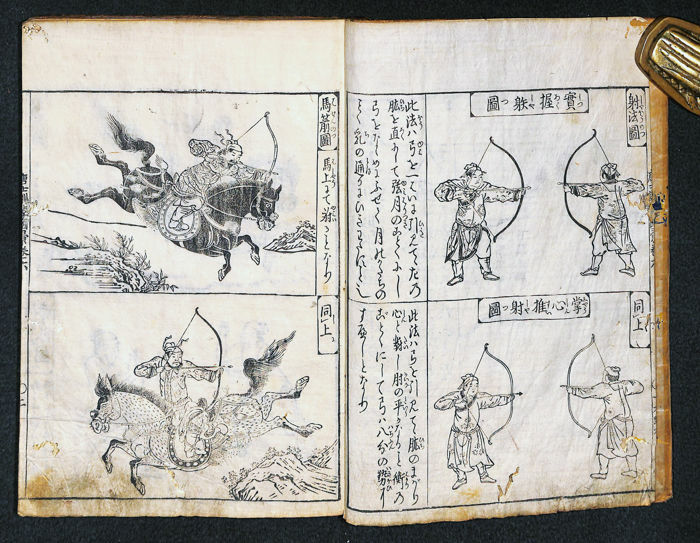 TACHIBANA MORIKUNI (1679-1748). 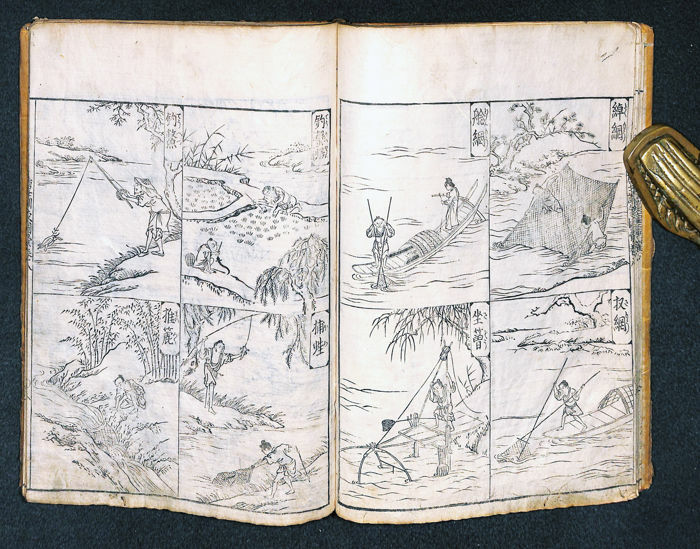 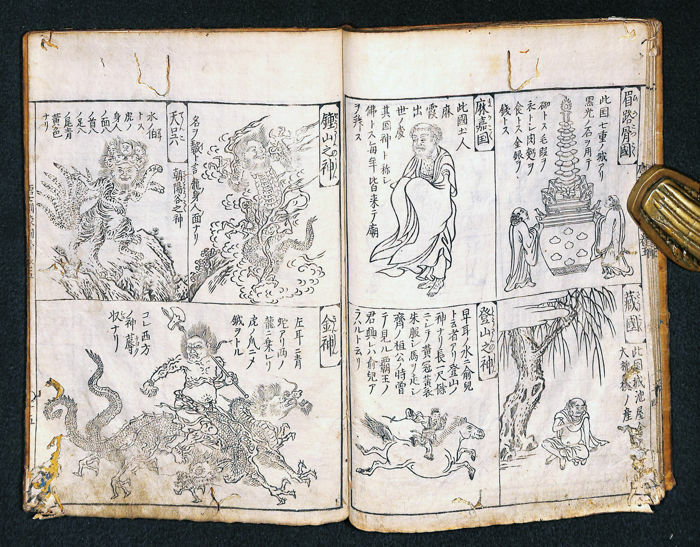 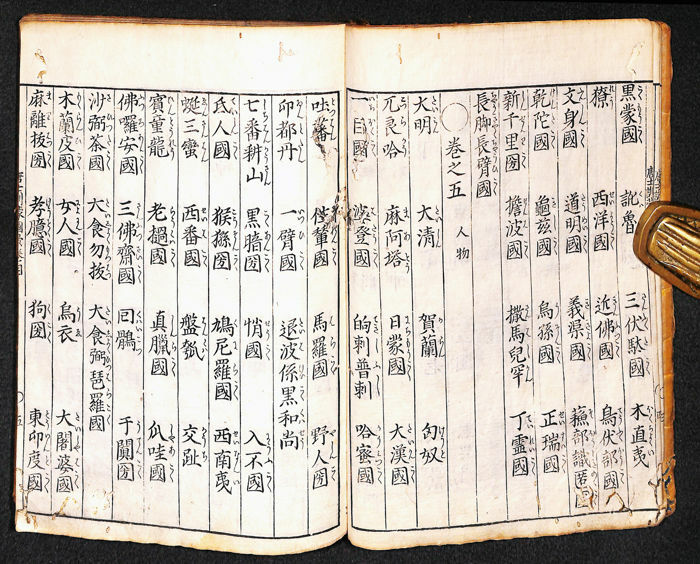 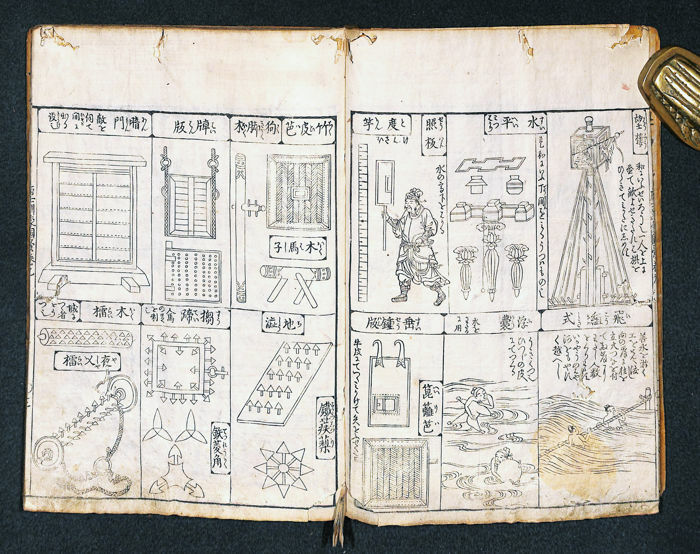 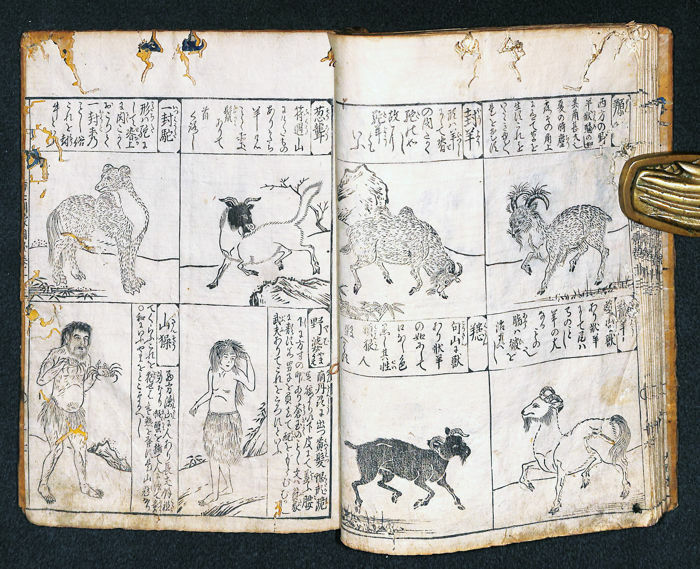 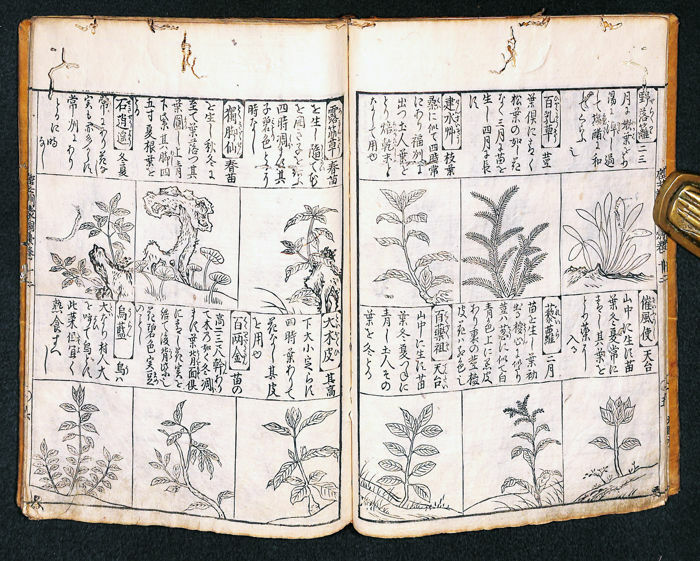 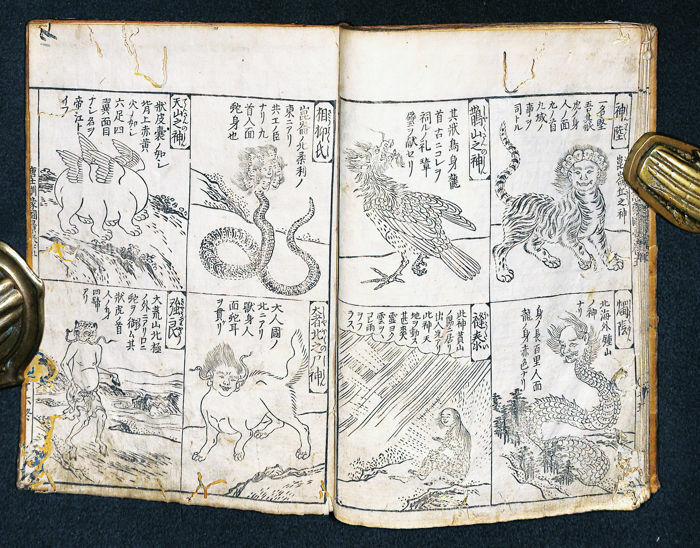 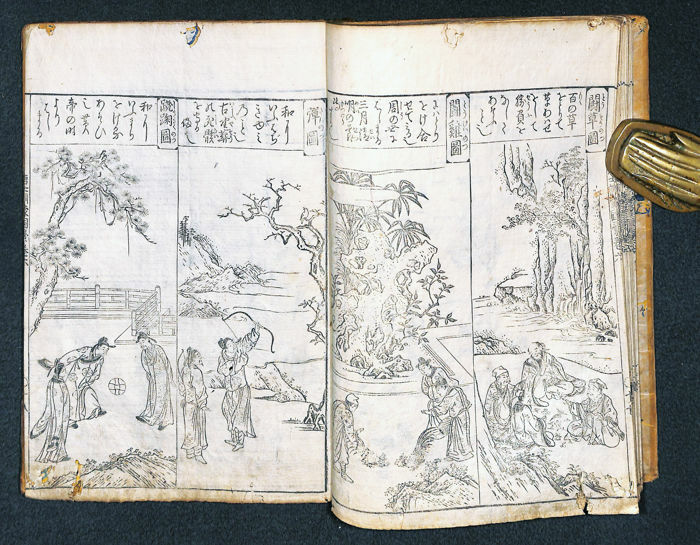 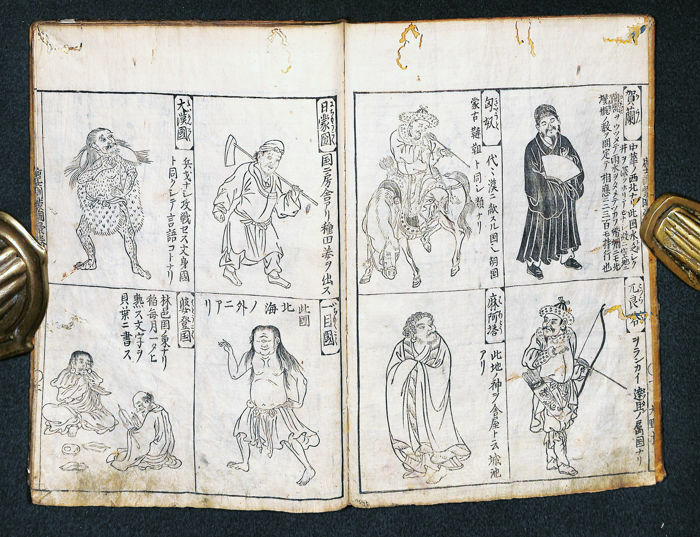 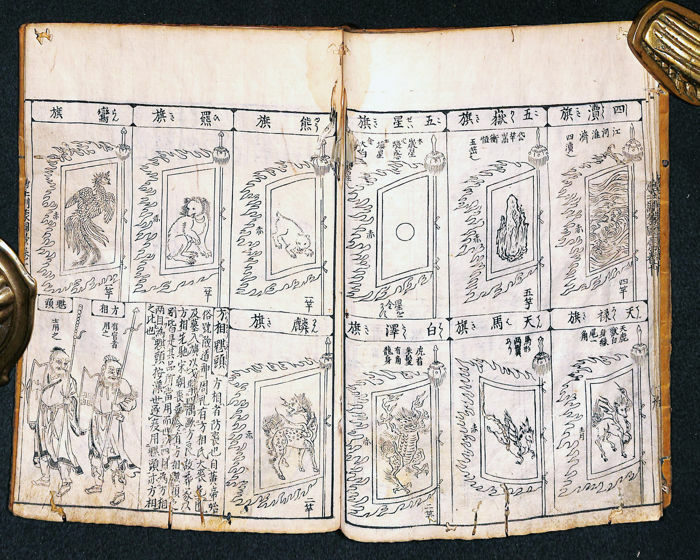 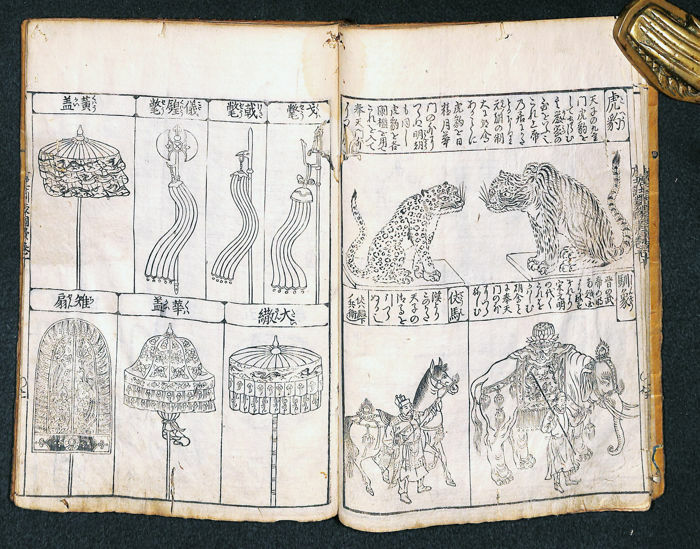 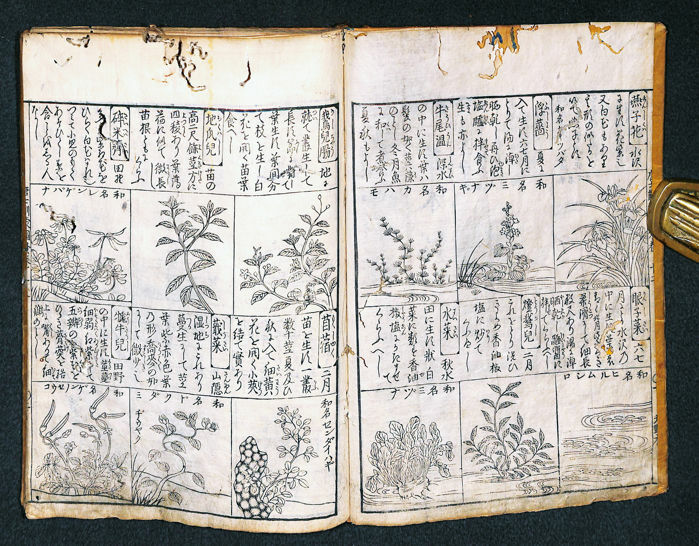 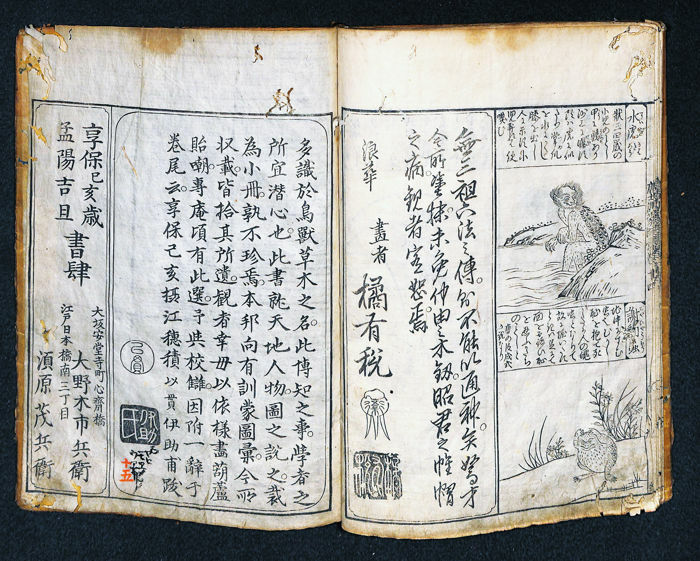 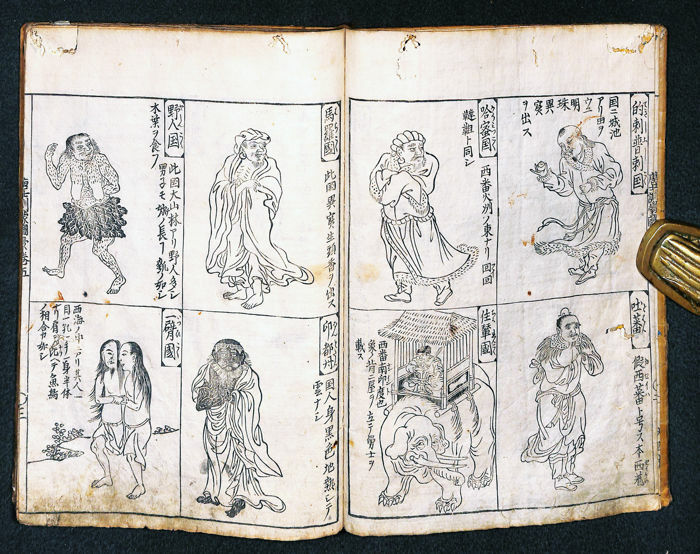 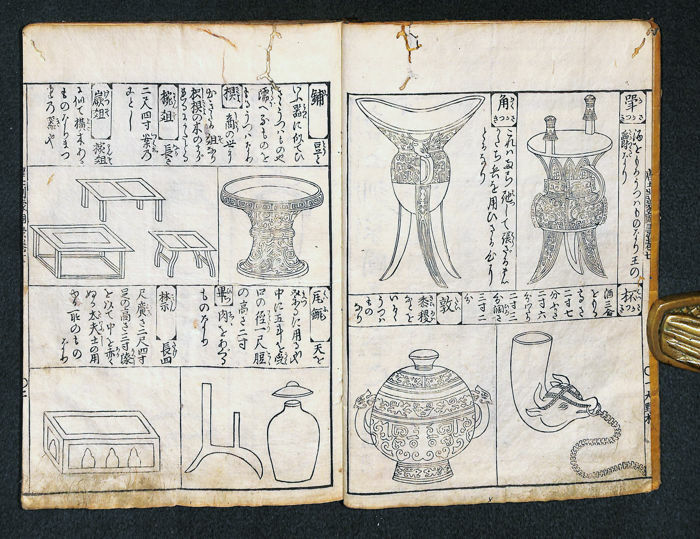 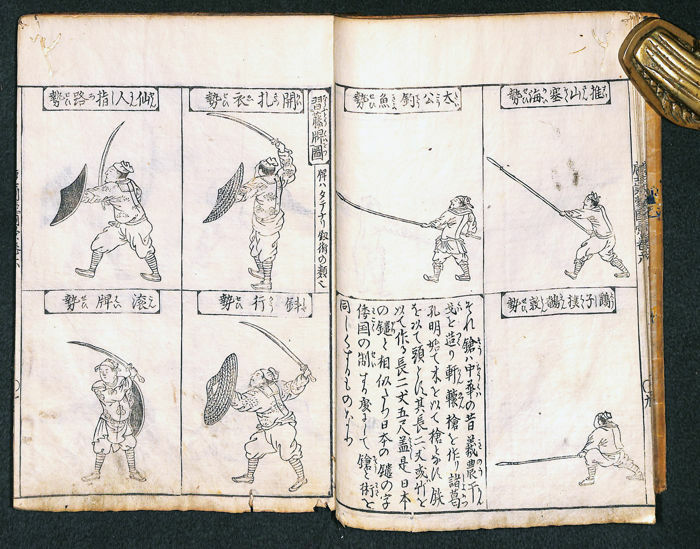 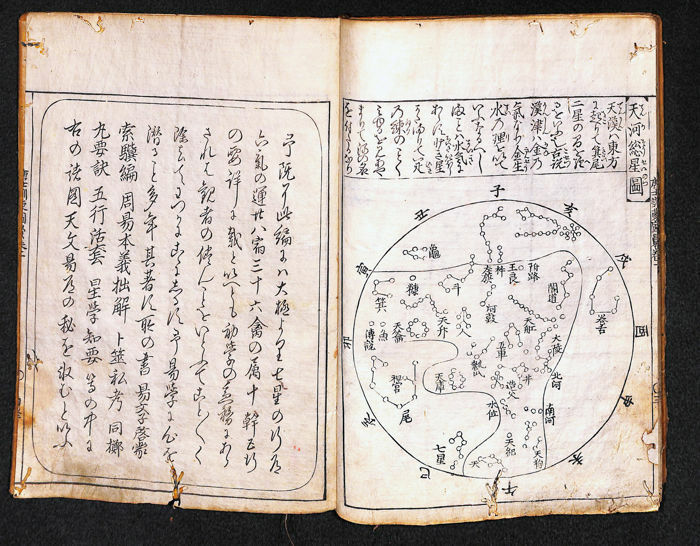 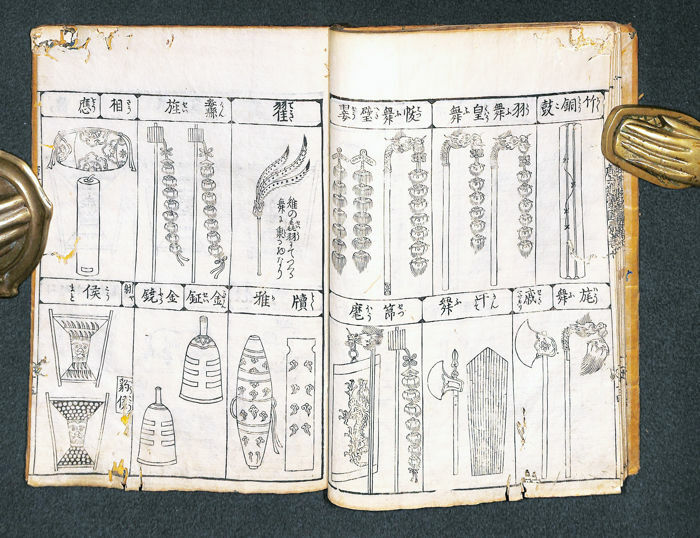 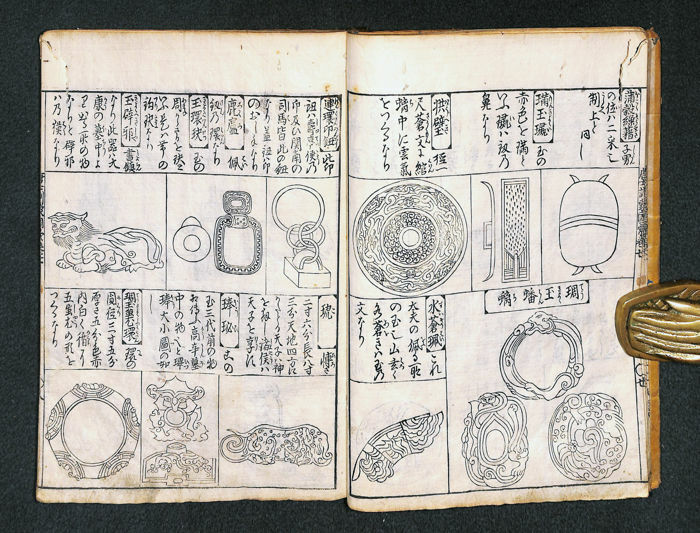 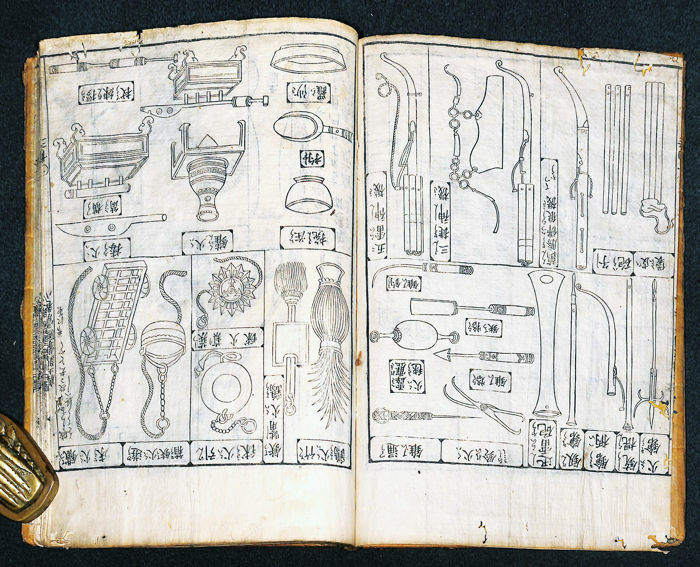 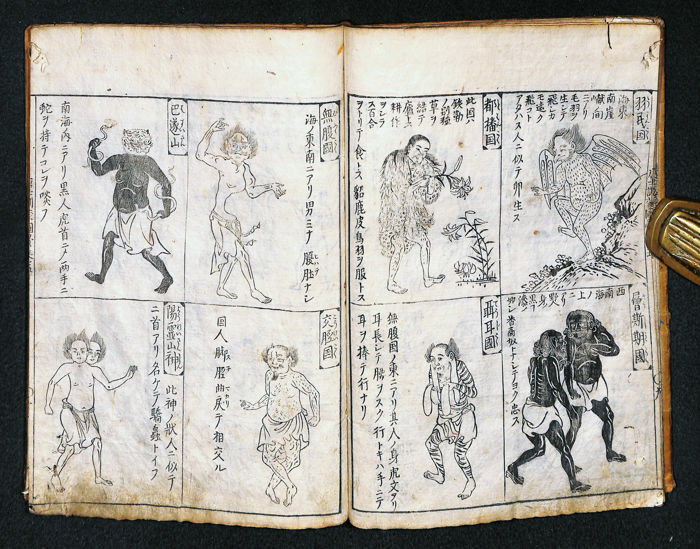 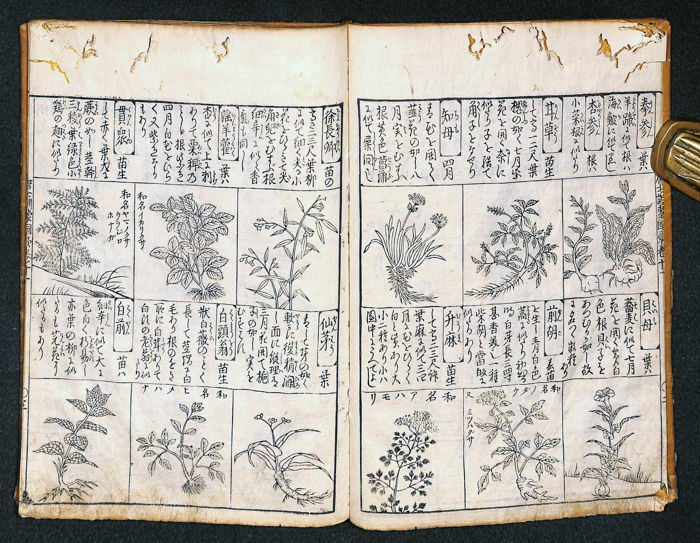 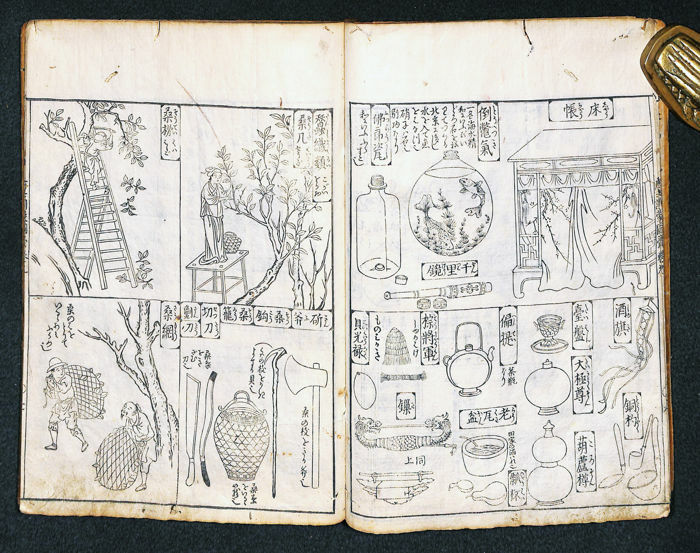 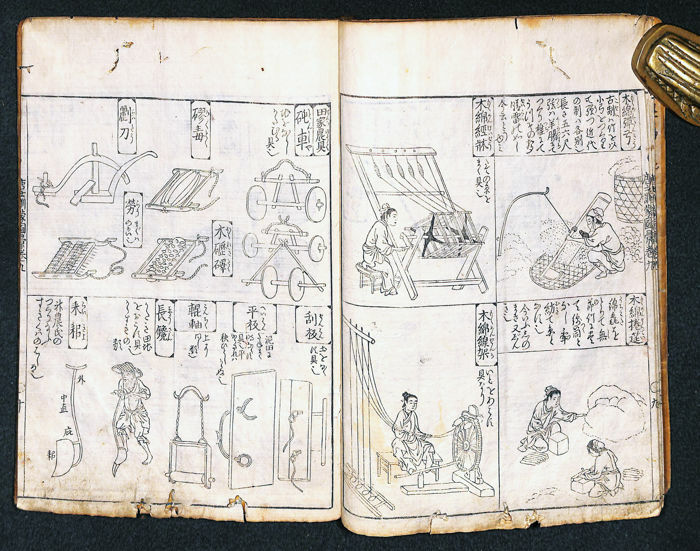 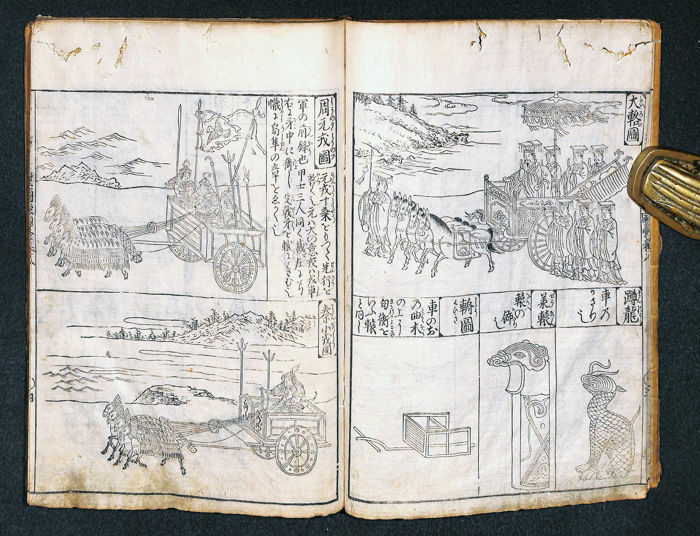 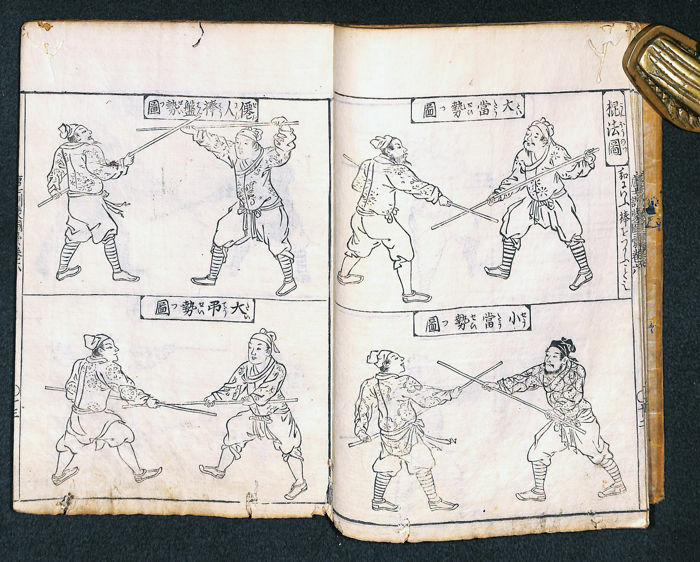 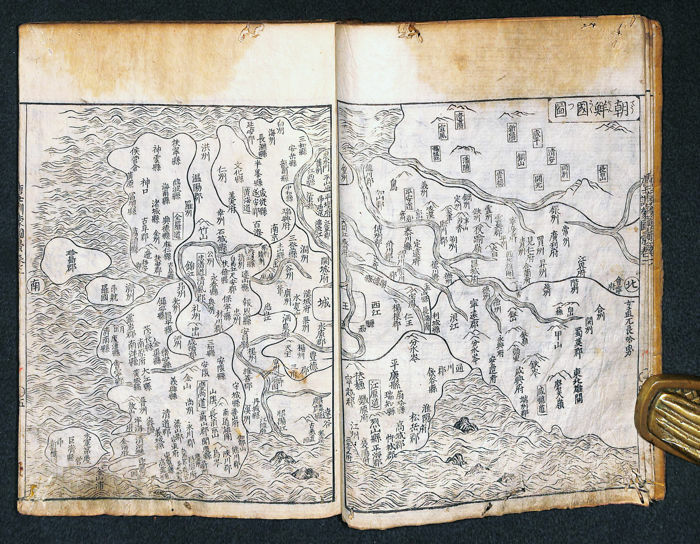 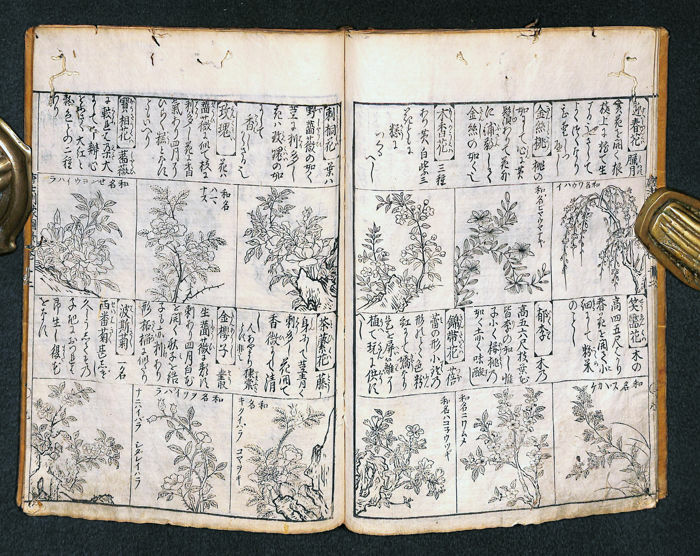 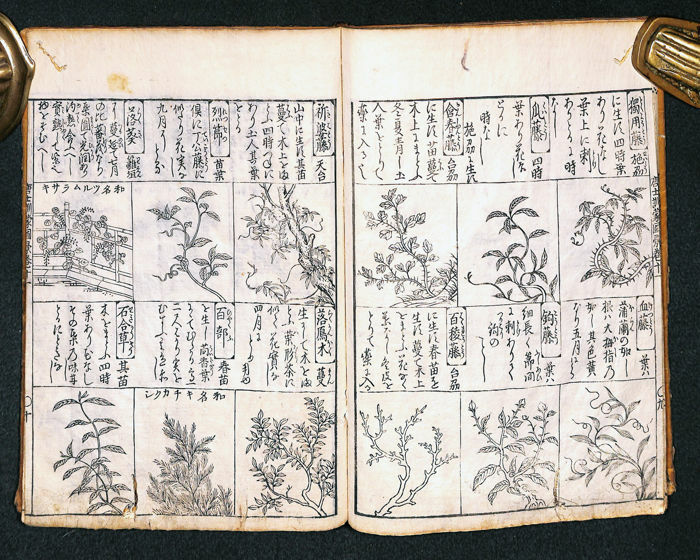 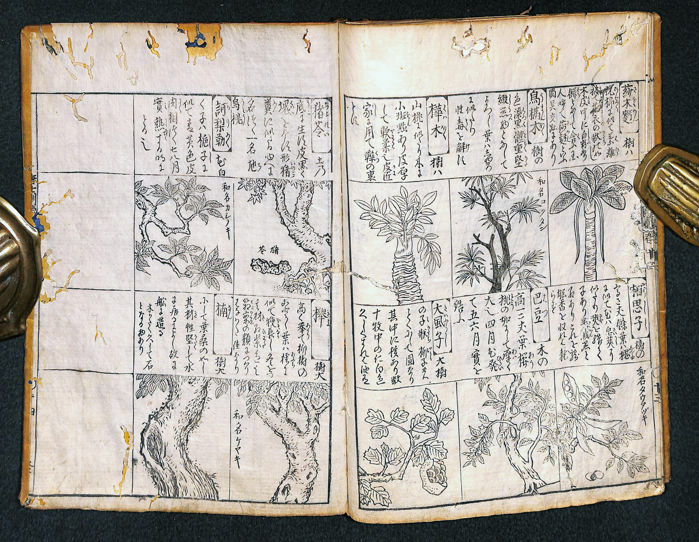 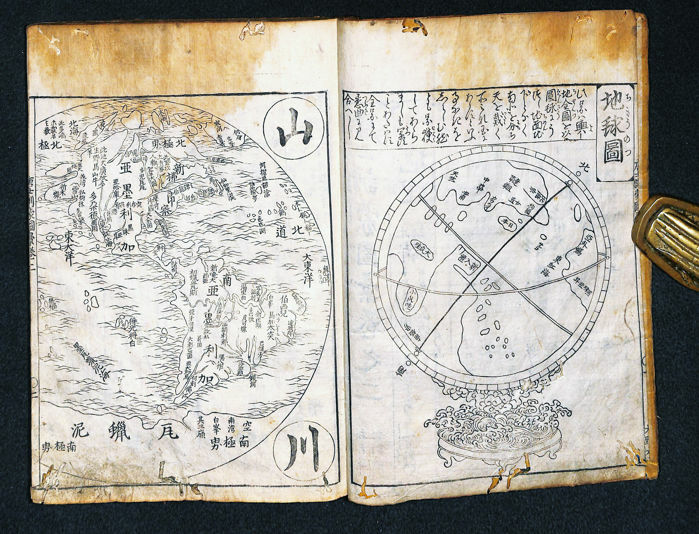 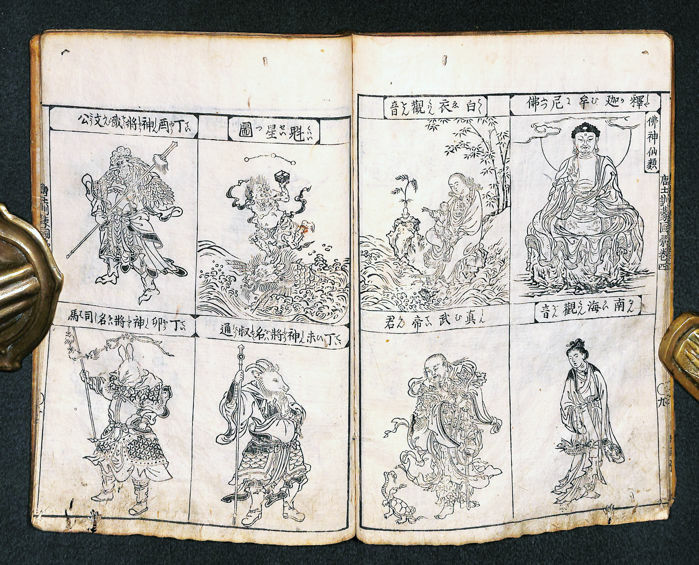 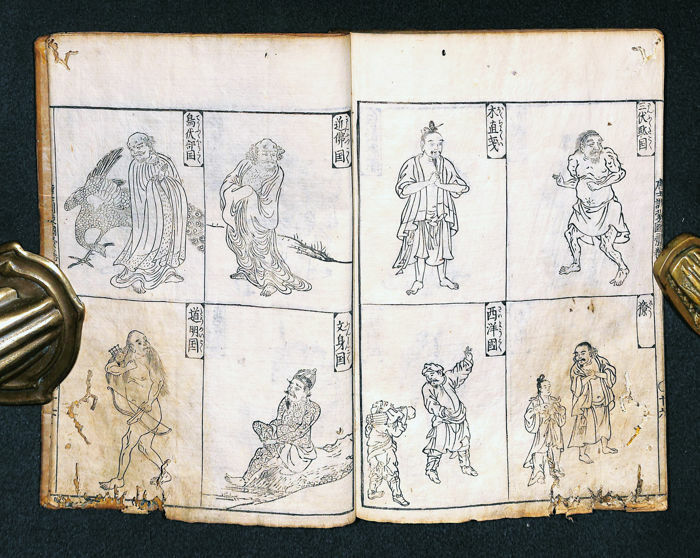 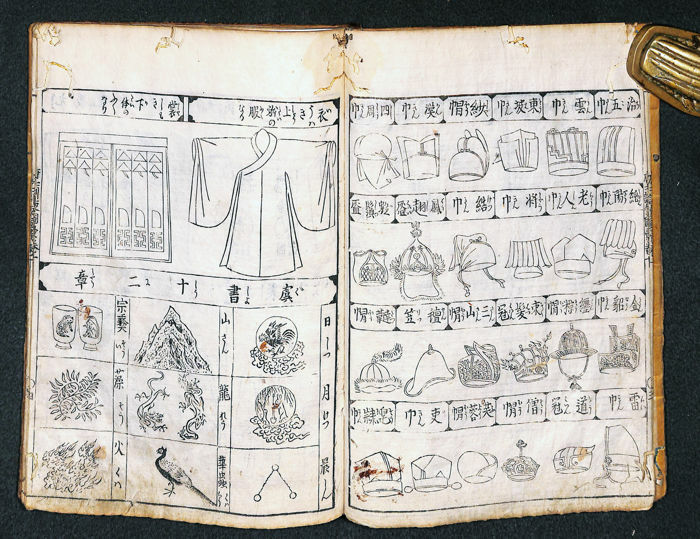 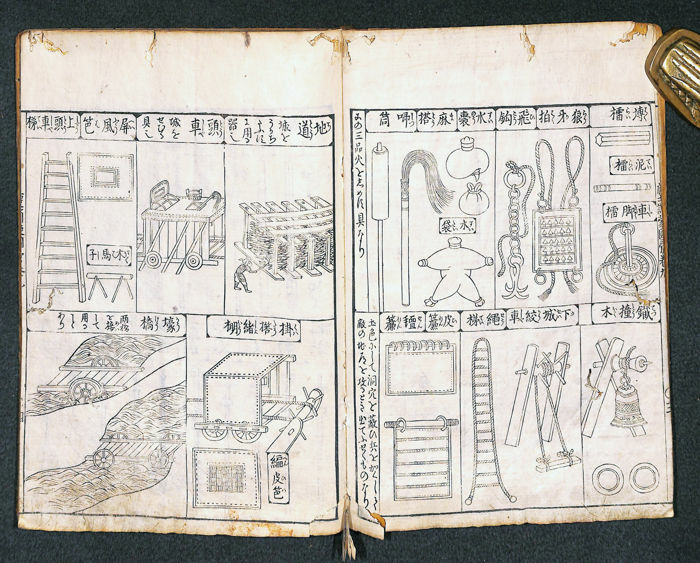 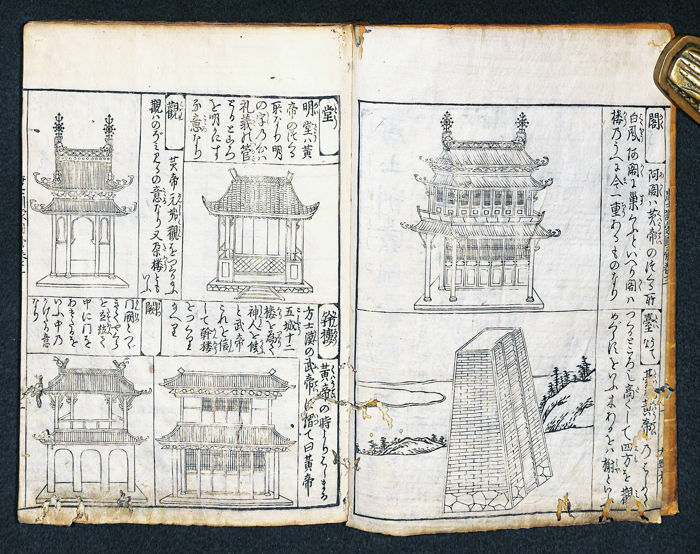 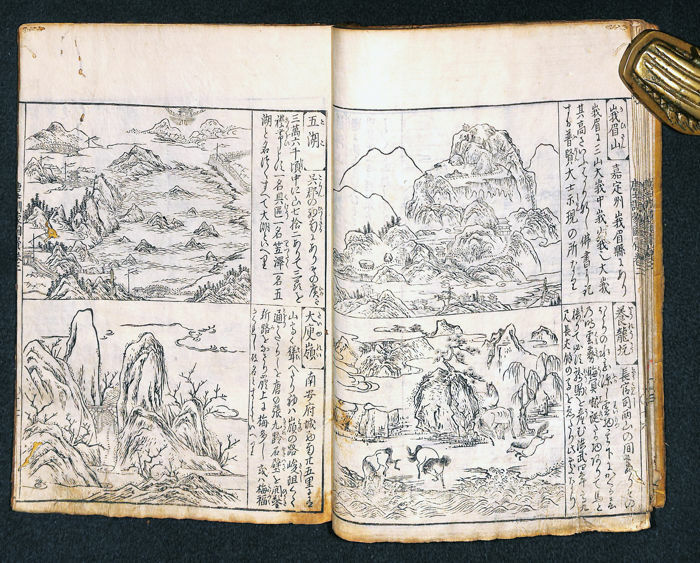 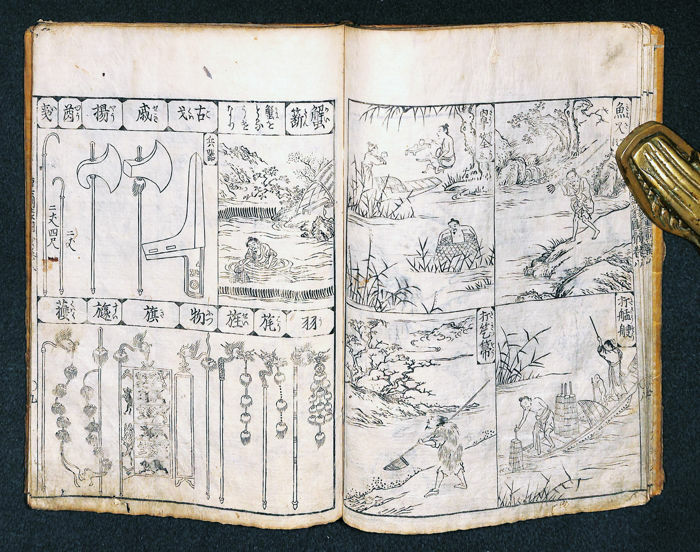 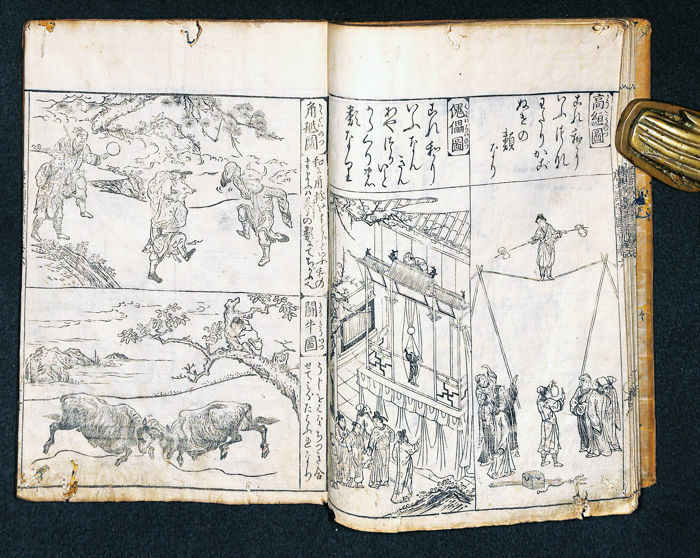 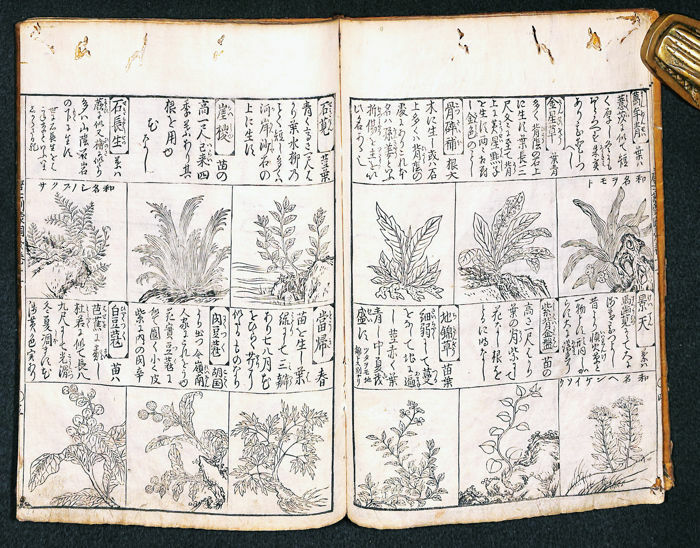 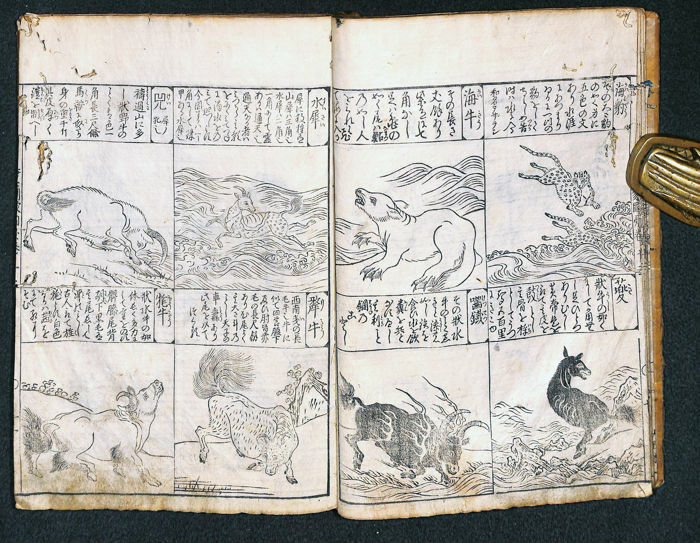 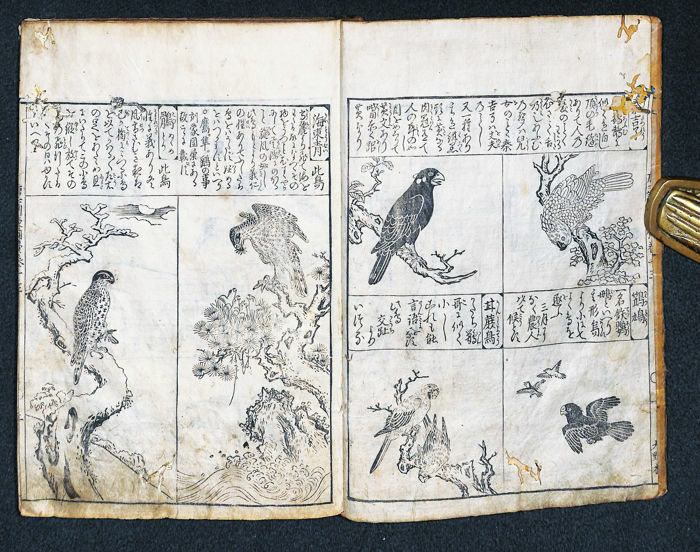 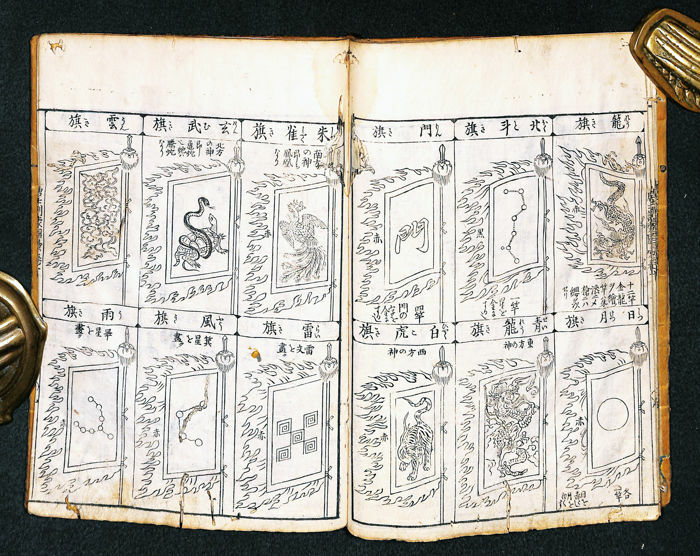 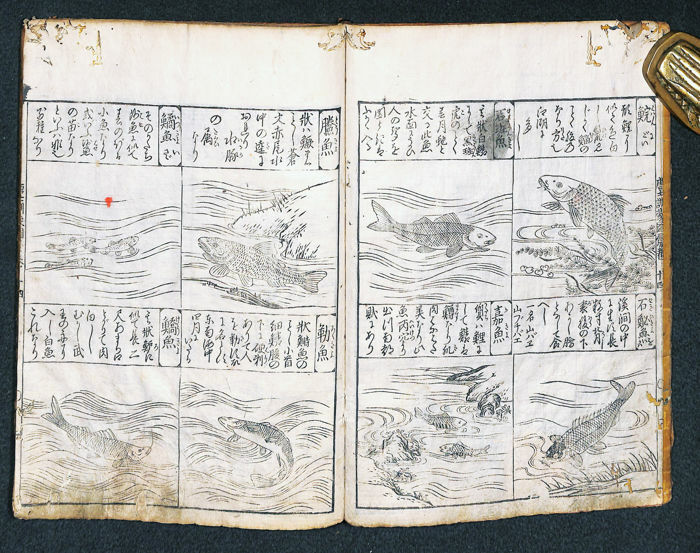 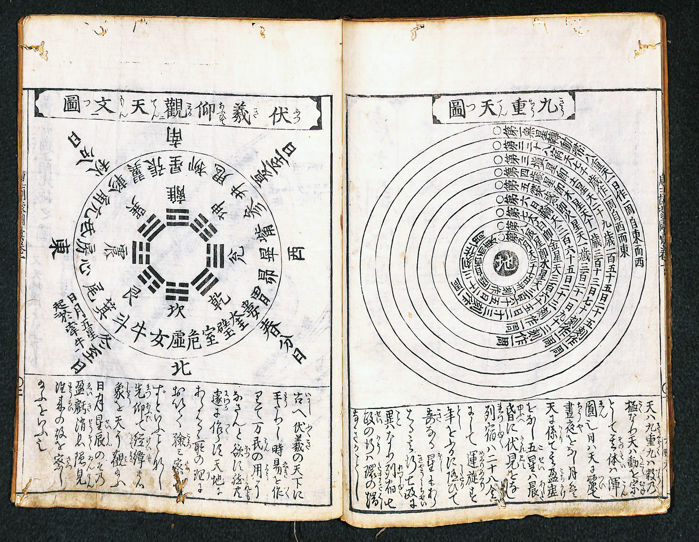 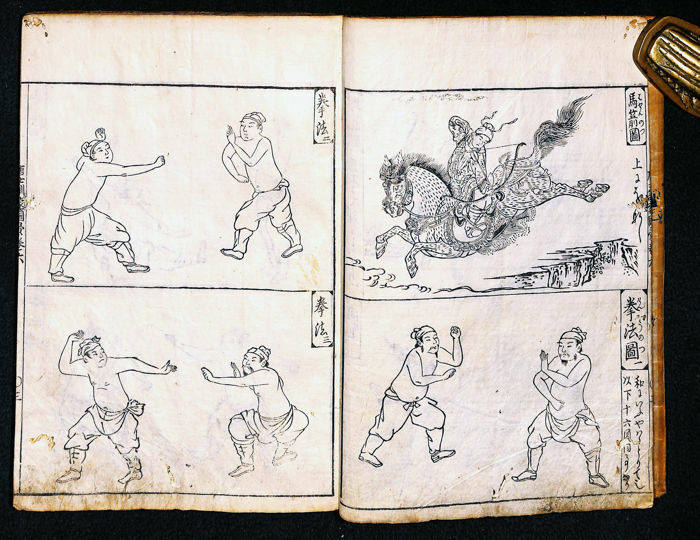 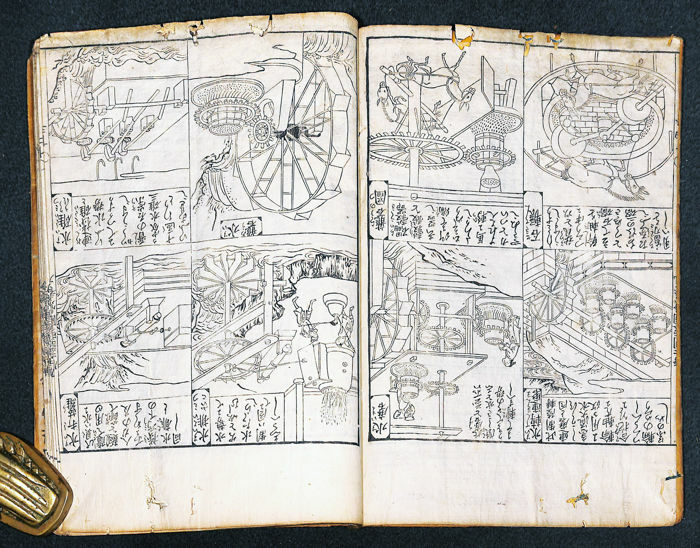 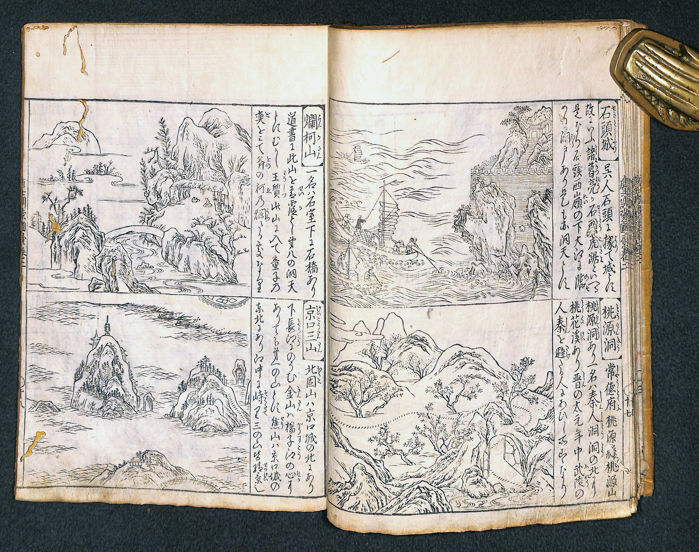 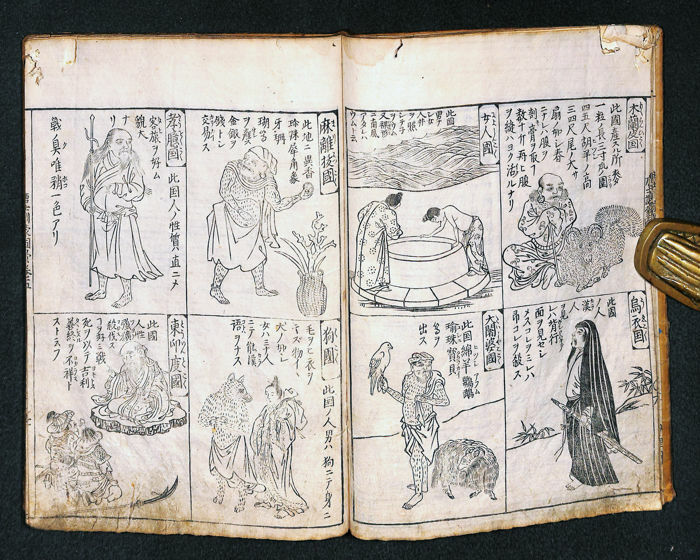 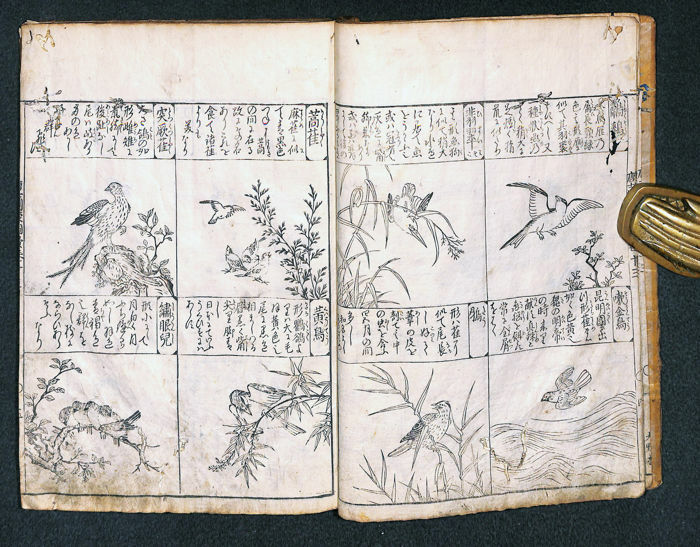 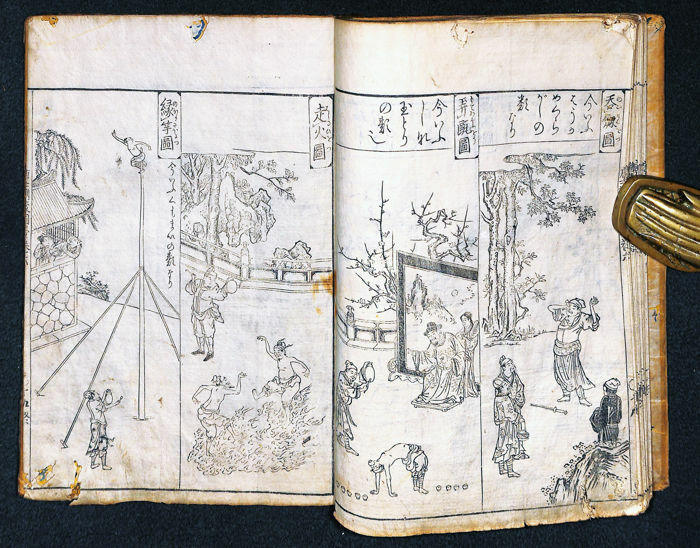 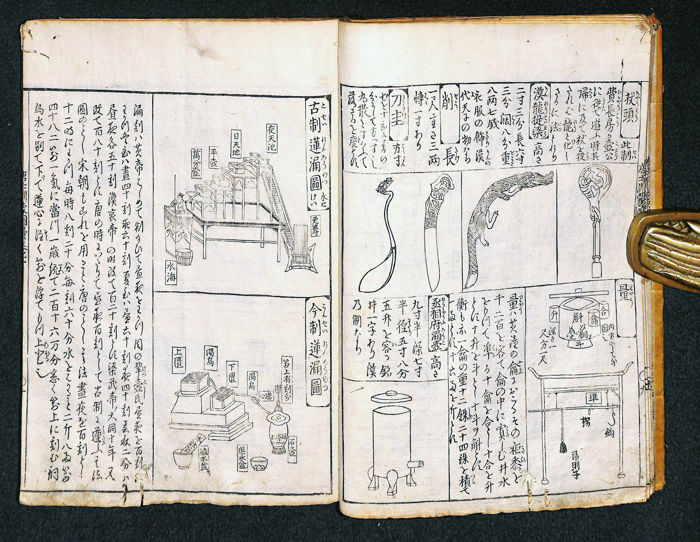 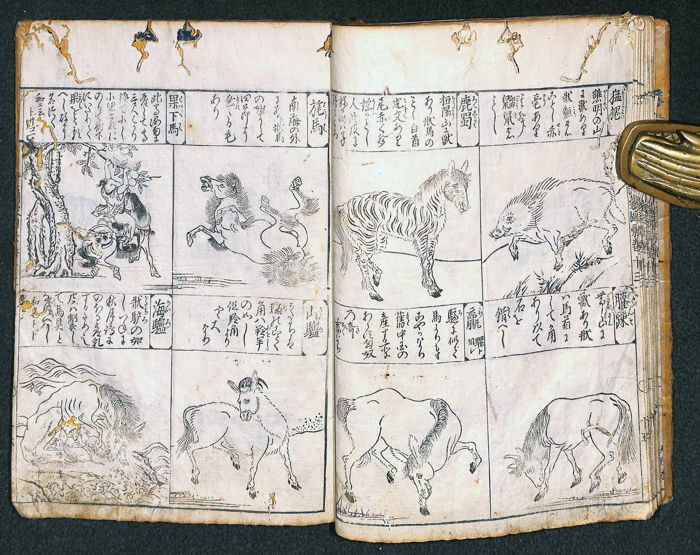 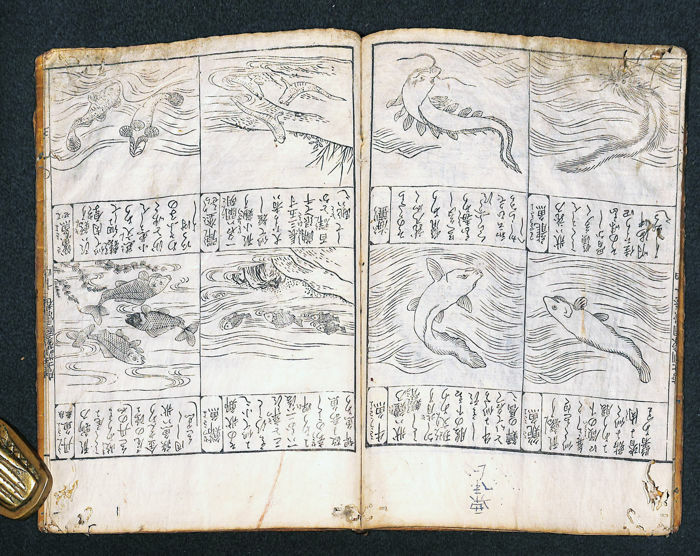 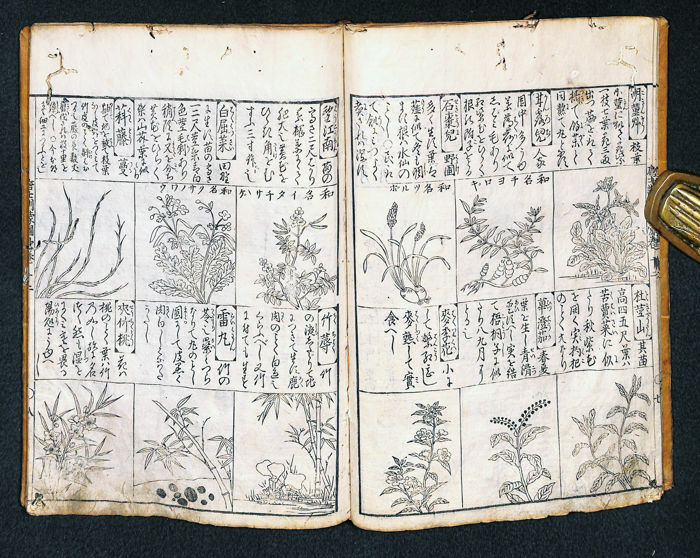 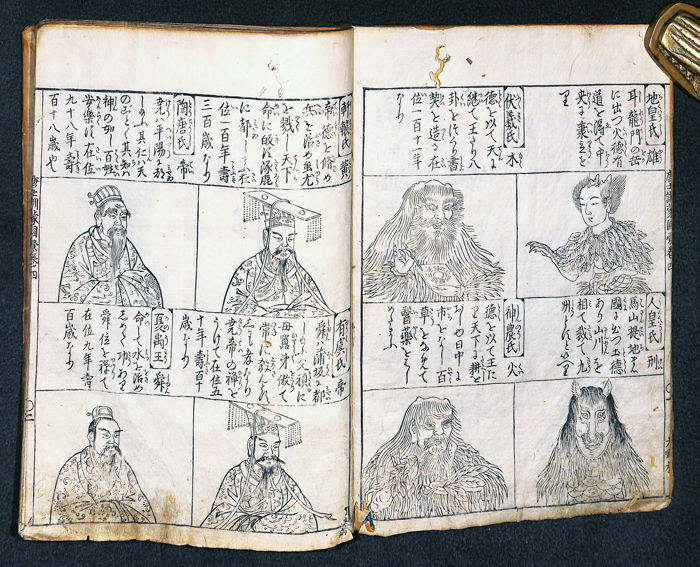 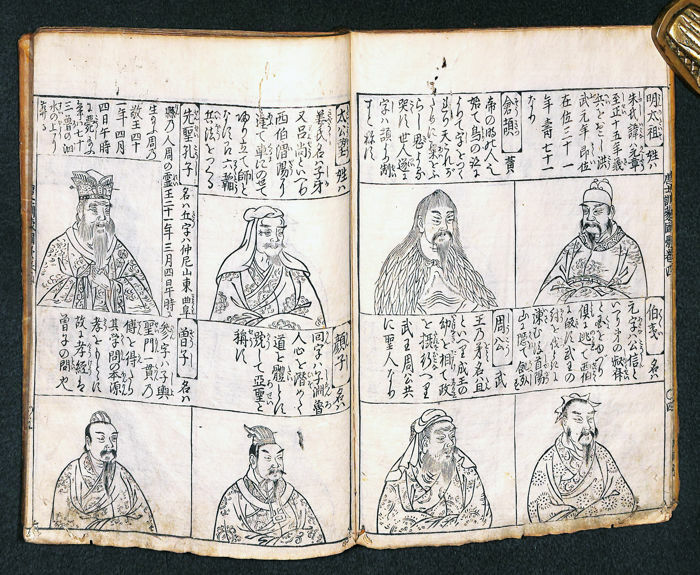 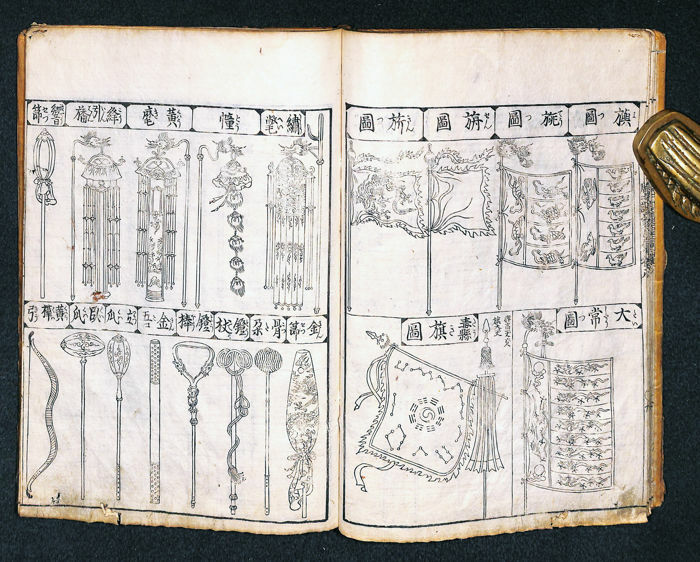 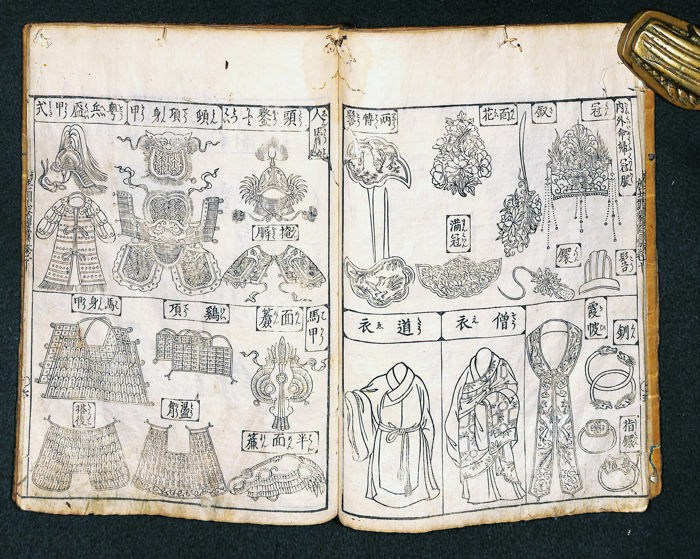 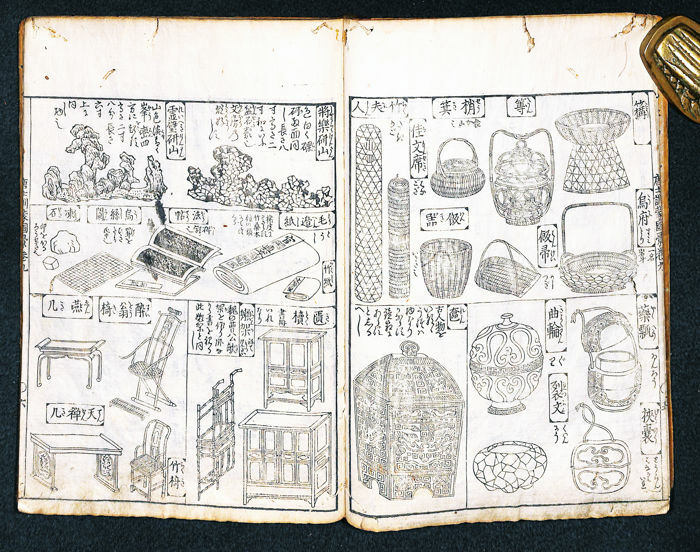 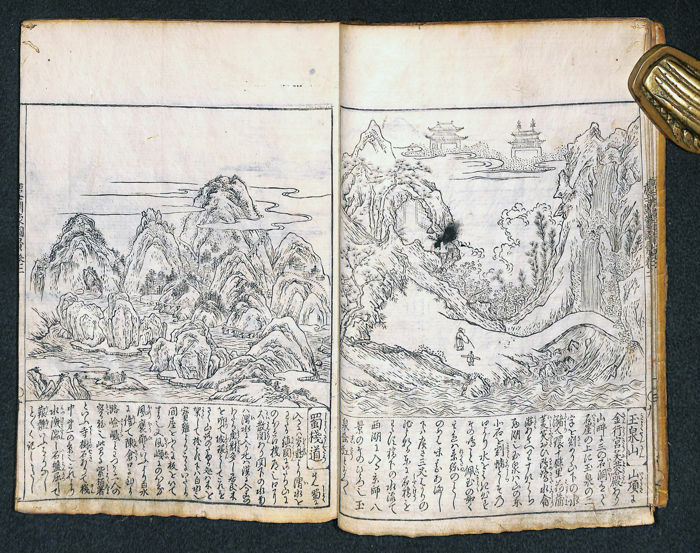 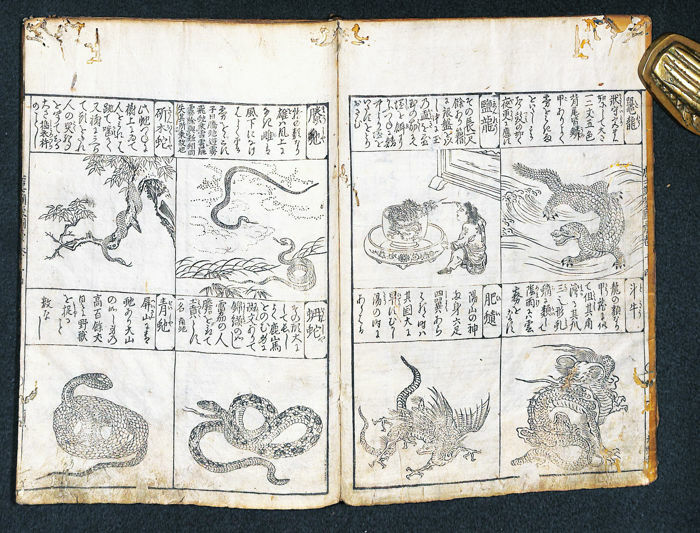 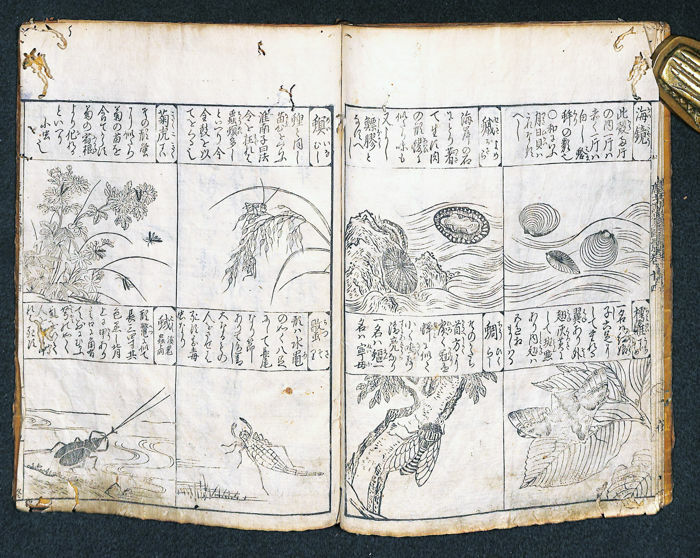 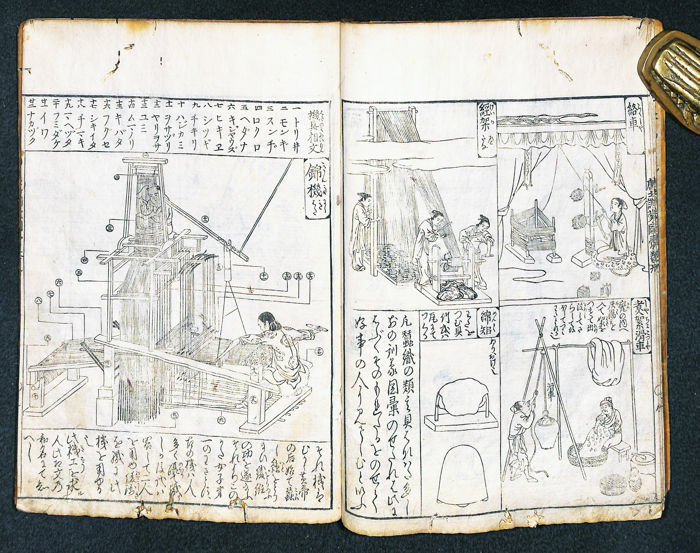 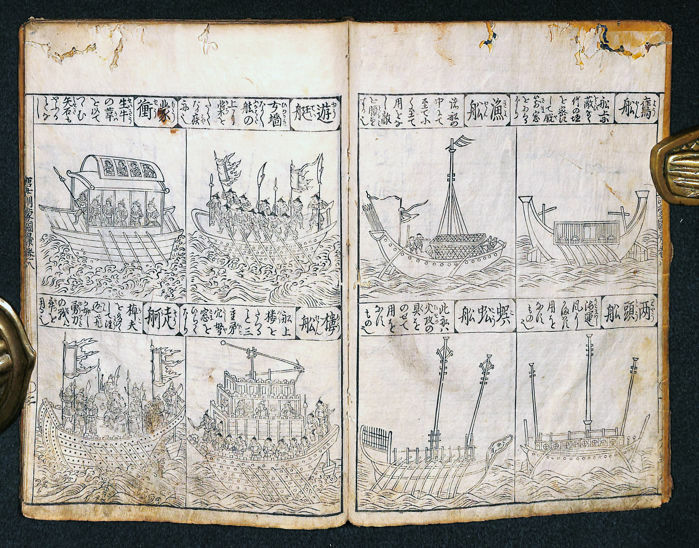 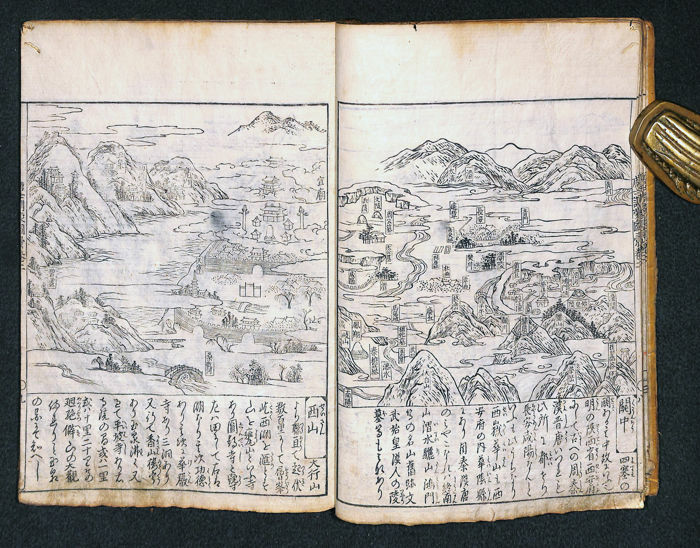 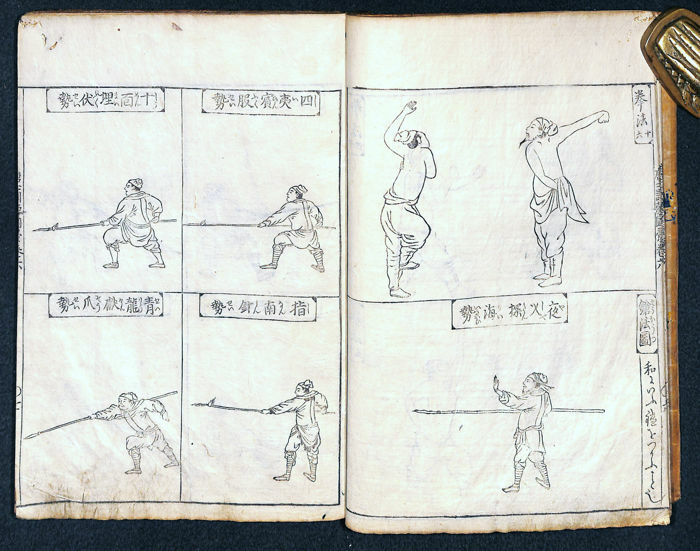 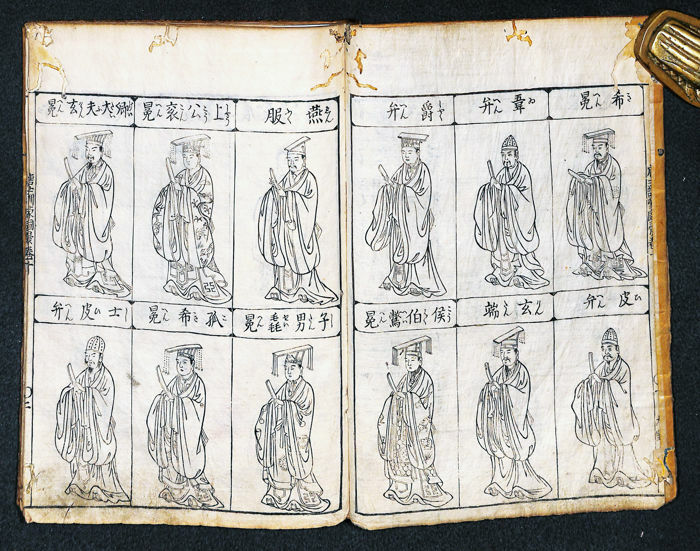 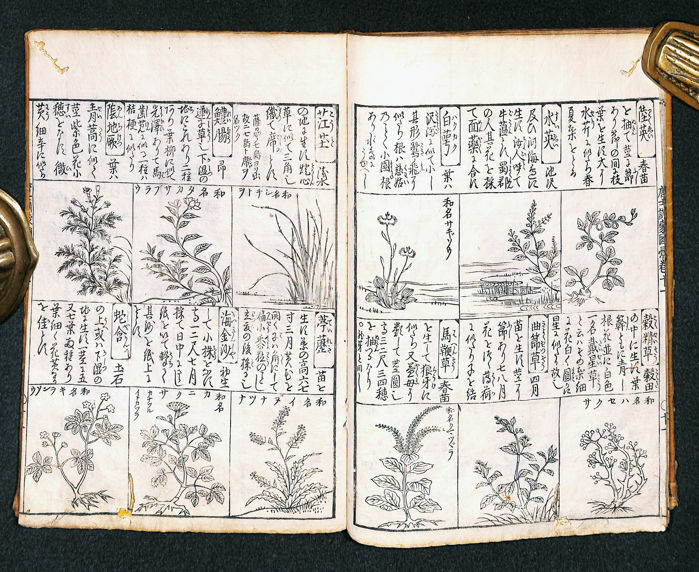 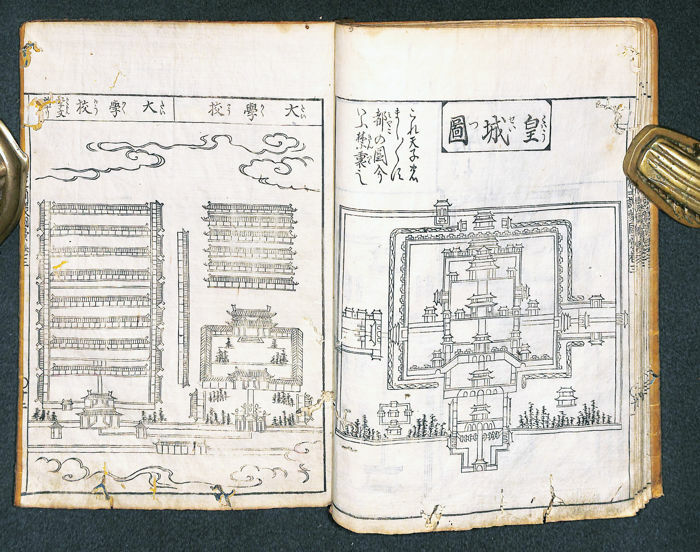 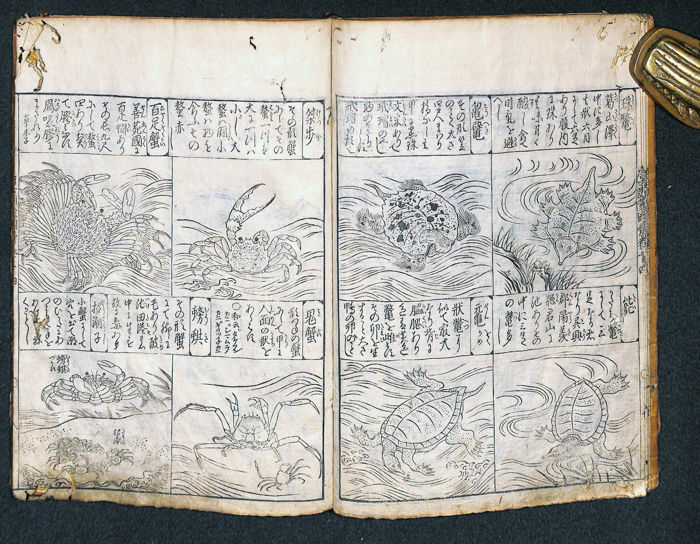 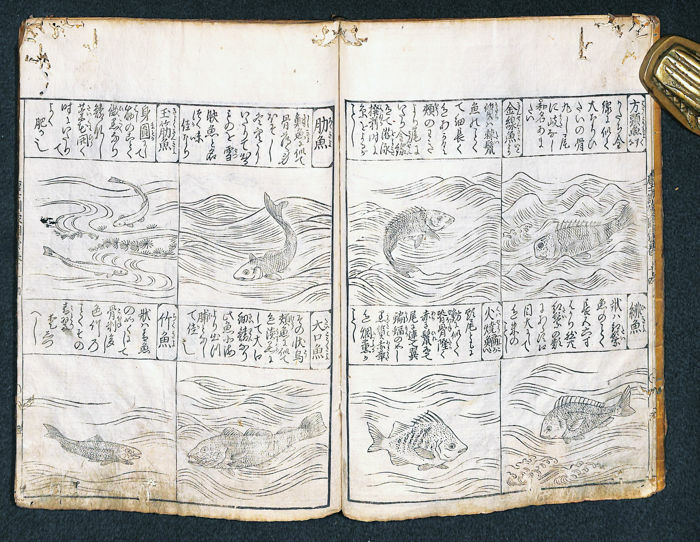 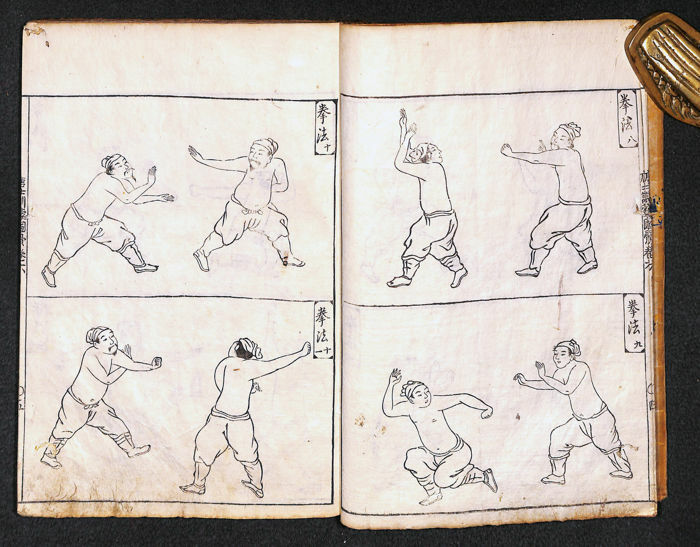 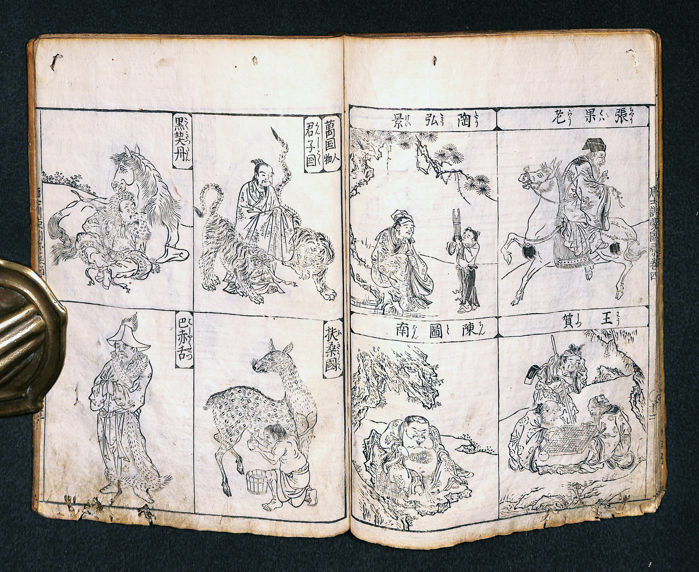 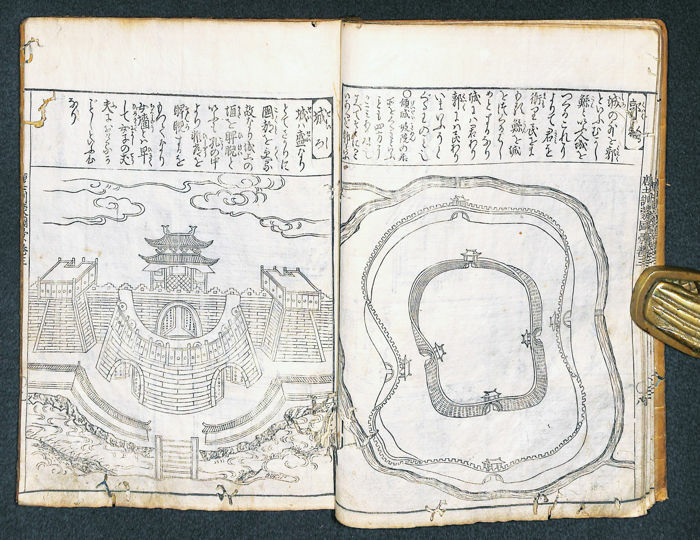 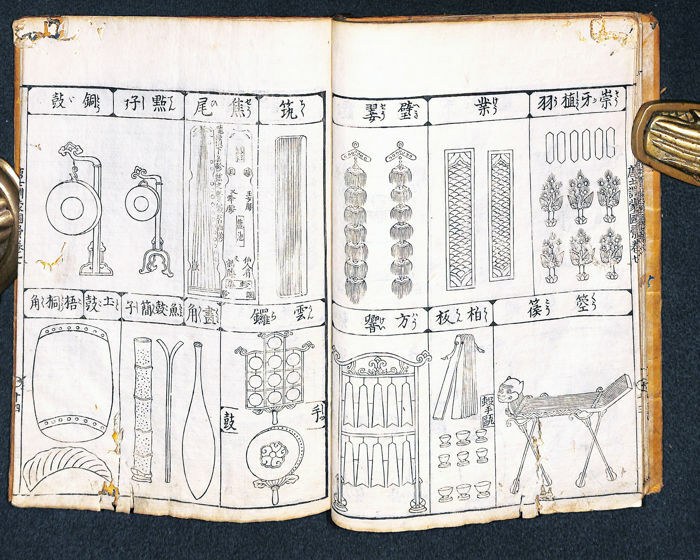 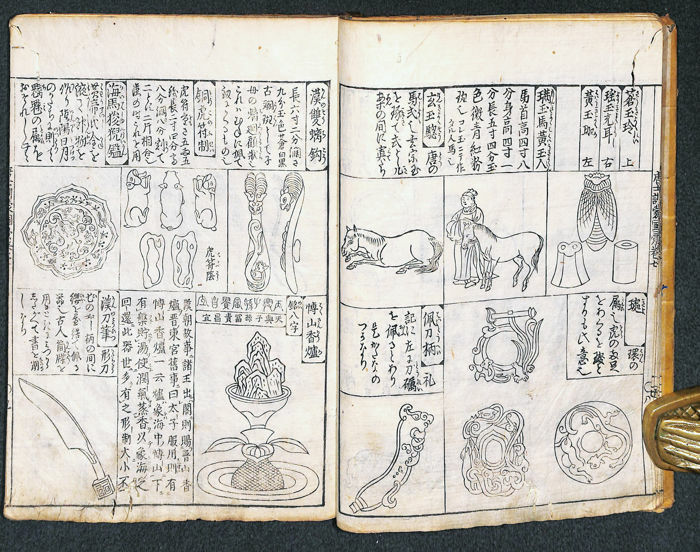 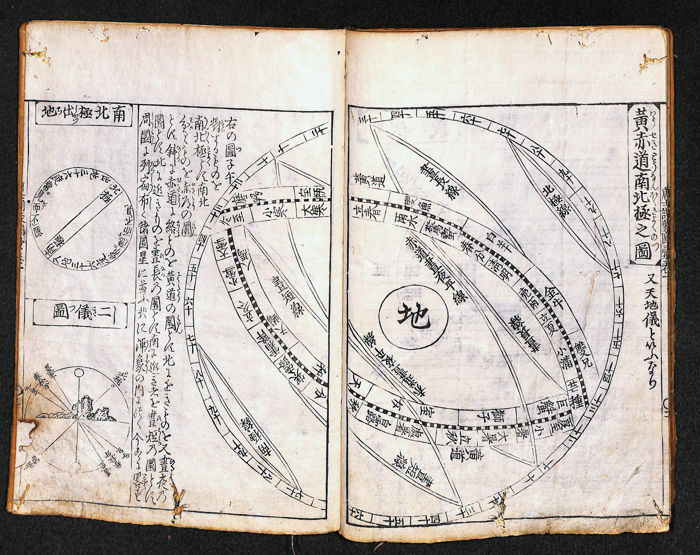 Morokoshi kinmo zui [«Illustrated Encyclopaedia on China»], Japan, 1719. 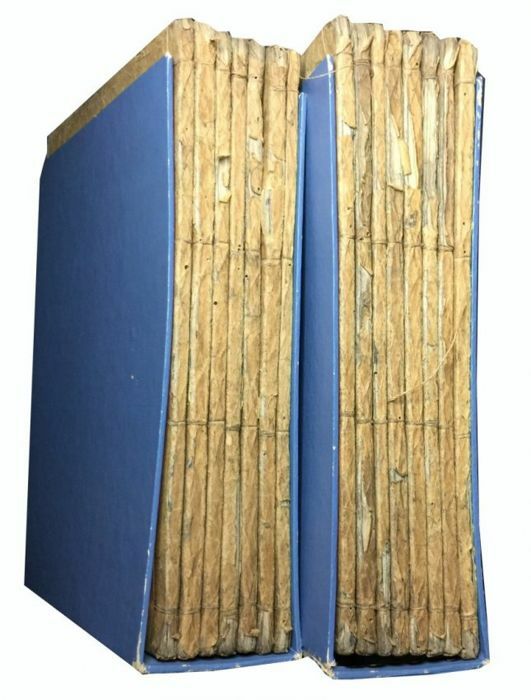 15 volumes, woodblock printed, original blue covers and title slips under later yellow covers. 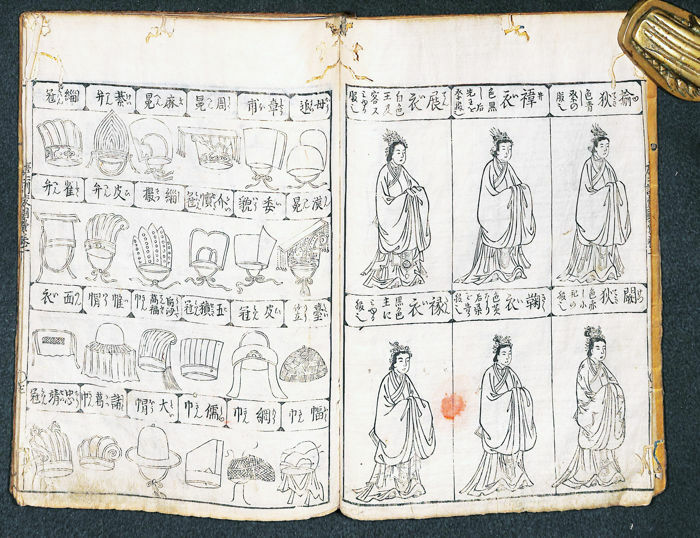 Diffuse traces of worming, water stains, traces of use. 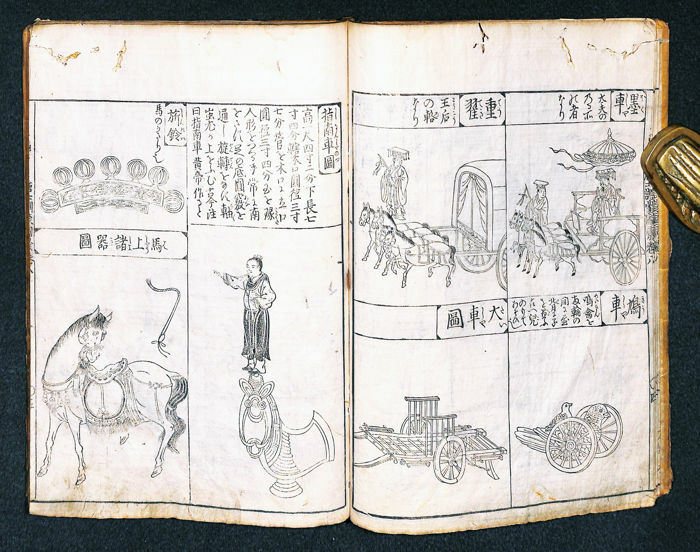 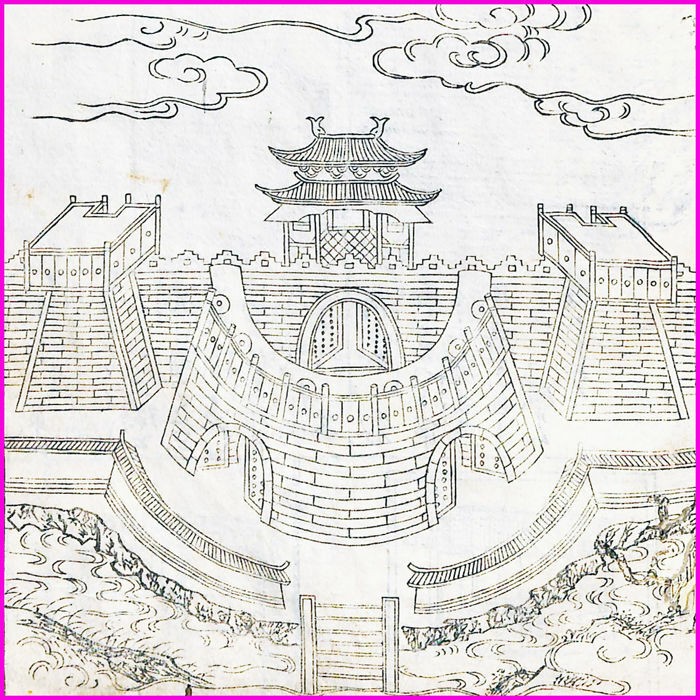 WONDERFUL AND EXTENSIVE ENCYCLOPEDIA ON CHINA, EXTENSIVELY ILLUSTRATED WITH DEPICTIONS OF CHINESE CUSTOMS, ASTRONOMY, MAPS, LANDSCAPES, ARCHITECTURE, MYTHOLOGY, MARTIAL ARTS, WEAPONRY, FARMING PRACTICES, FLORA AND FAUNA. 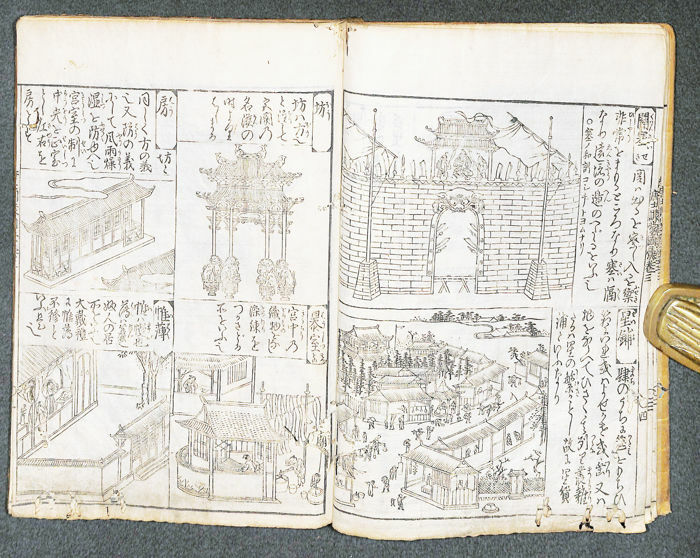 This work was illustrated by the celebrated Osaka artist Tachibana Morikuni and each volume is extensively illustrated with depictions of contemporary China, Chinese learning and customs, including astronomy, maps, landscapes, architecture, mythology, martial arts, weaponry, farming practices, flora and fauna. 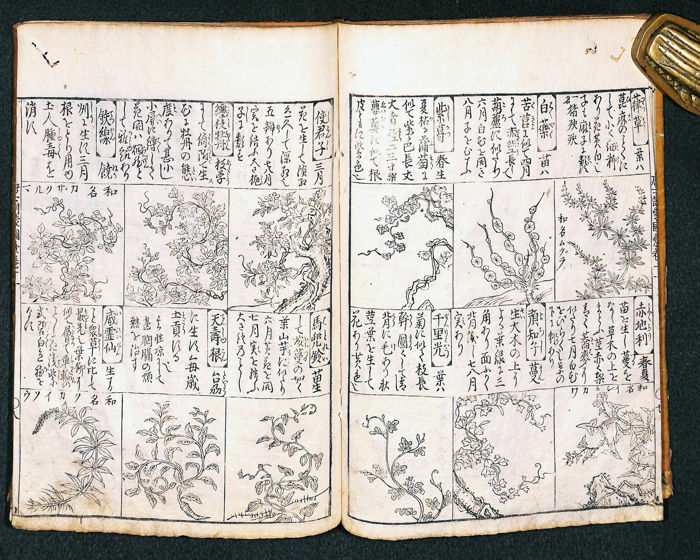 Tachibana Morikuni: A leading eighteenth century painter, illustrator and writer, Tachibana Morikuni was a master of both Kano and Tosa styles. 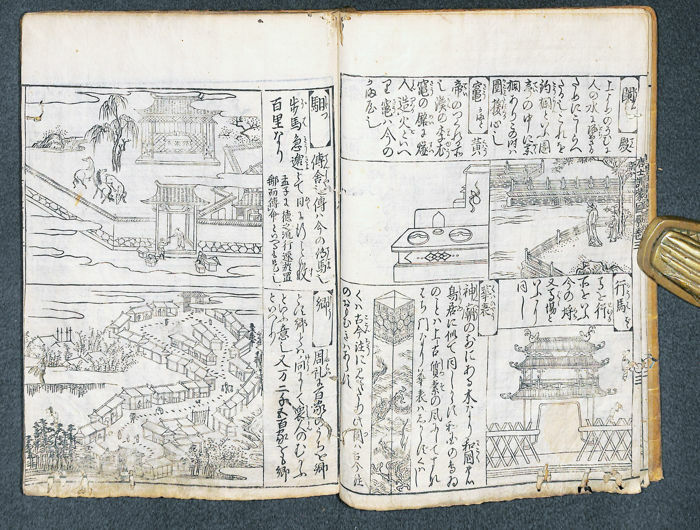 A student of Tsuruzawa Tanzan, Morikuni lived and worked in Osaka. 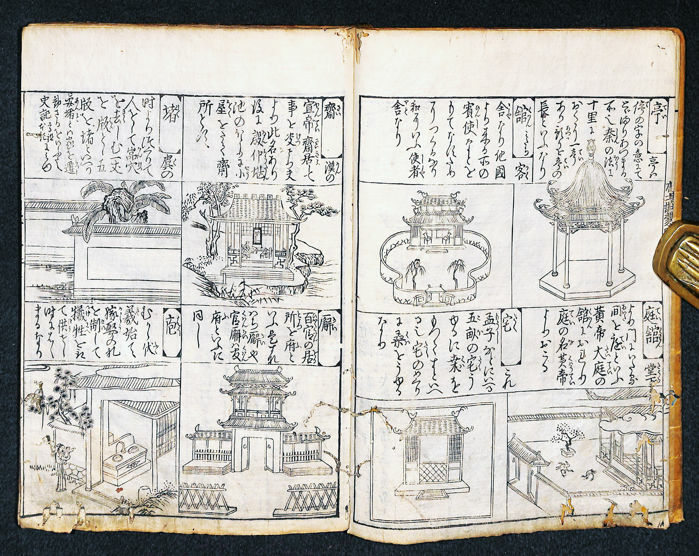 His major illustrated books include, Ehon Koji-dan (1714), Morokoshi Kimmo-zui (the work listed here) (1719), Ehon shaho-bukuro (1720), Gaten tsuko (1727), Honcho gaen (1729), Utai gashi (1732), Ehon oshukubai (1740) and Unpitsu soga (1749). 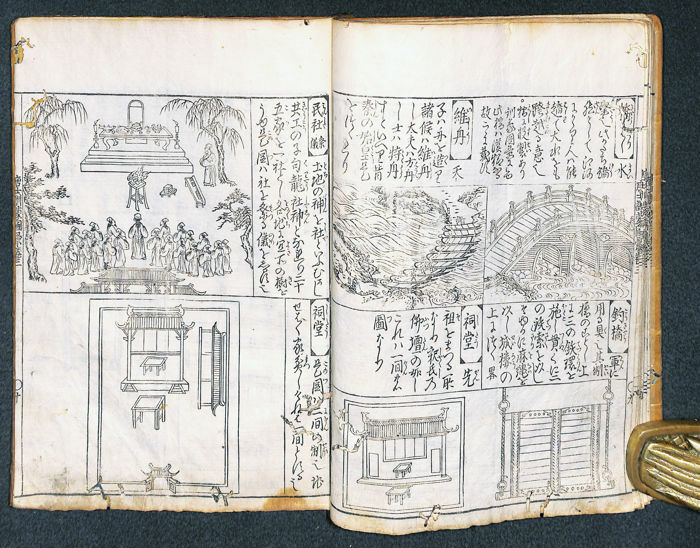 James E. Fagan was an American collector with a special interest in the introduction of Western culture and technology to Japan’s closed Edo-era society (1603-1868), also known as the Tokugawa period. 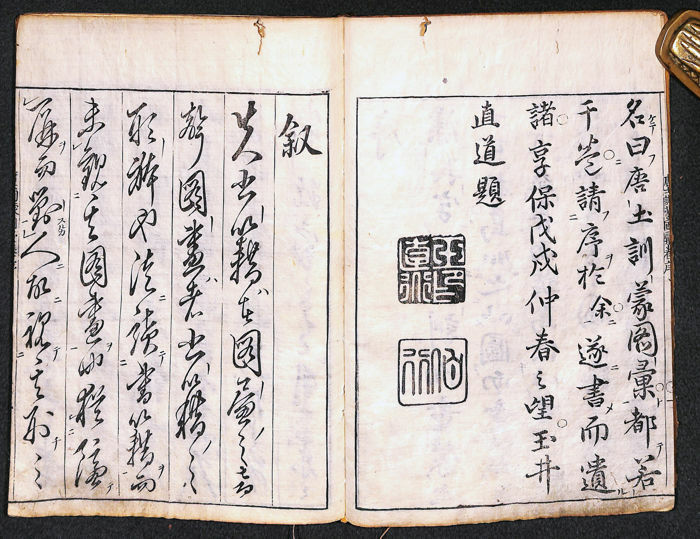 Mr. Fagan studied Japanese language and history at Stanford University, and served as a US Naval officer in the Pacific theatre. 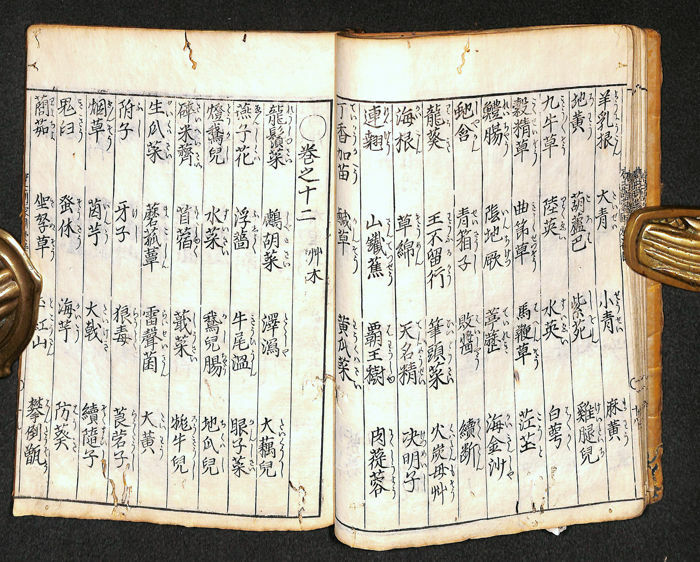 He then lived and worked in Japan as an attorney in the 1950’s and 1960’s. 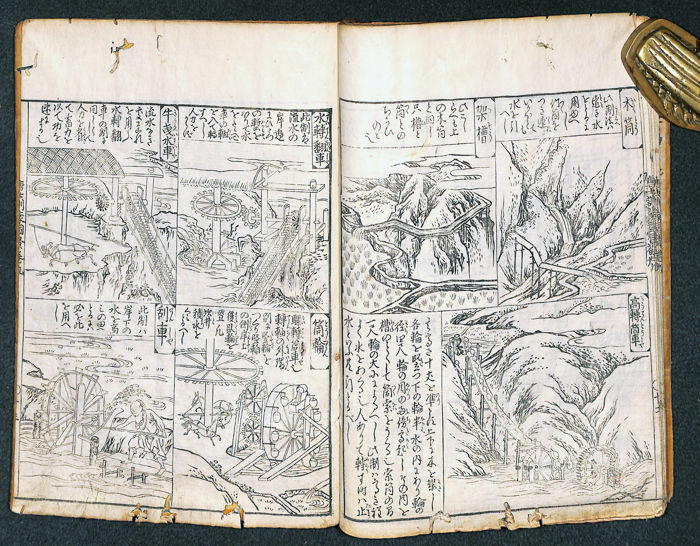 During this time, Fagan assembled and researched his collection of rare Edo-era woodblock and manuscript maps, prints and books not available outside Japan. 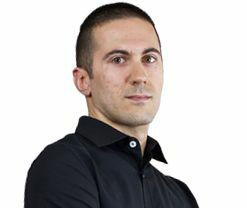 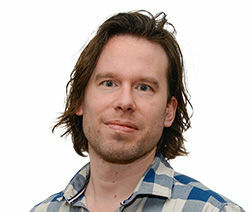 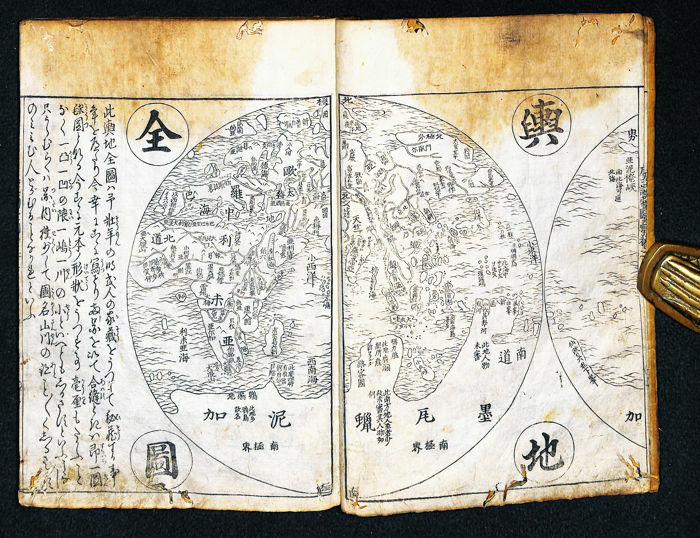 Highlights include Nagasaki-e (showing the Japanese fascination with the Dutch East Indies (VOC) outpost at Deshima island), early Rangakuexaminations of Western science and languages, the evolution of Japanese cartographic knowledge, and the study of English and Russian military might and technology. 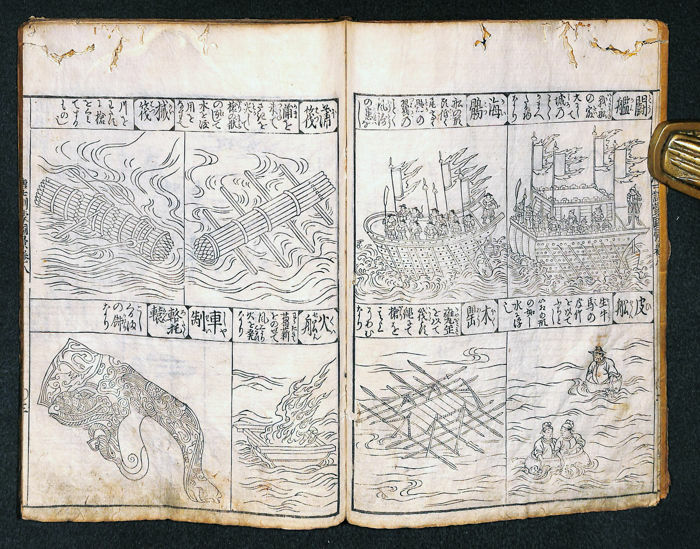 Imaginative illustrations and maps, from Japanese castaways reporting back to the Japanese Court, also provide a glimpse of how the Western world appeared to the first Japanese to circumnavigate the globe. 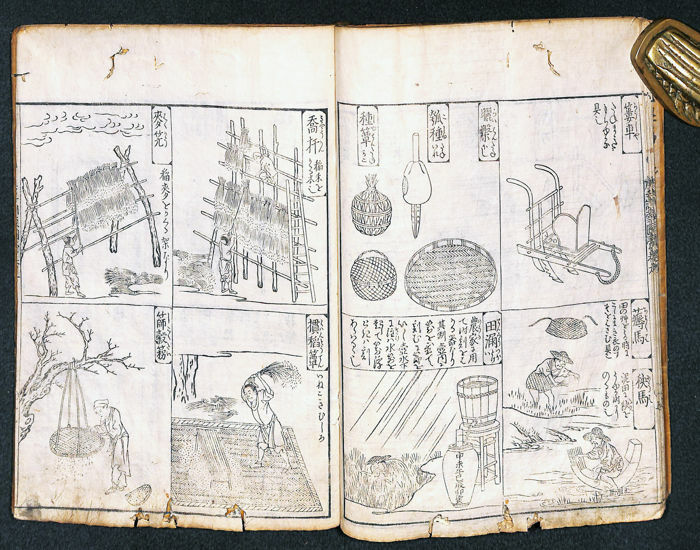 The collection demonstrates Japan’s keen curiosity about the Western world during its long isolationist period, and the artful way the Japanese perspective captures the impact of European contact.